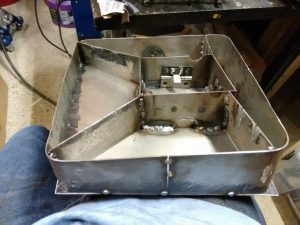 I have been considering building a dry sump for a long time, in fact, ever since I started building the the car. However they are a fairly complicated piece of kit, and I have therefore shied away from them until now. Fortunately I changed my mind due to the data I collected at Snetterton and having access to a decent Turret Mill at my new job. Lets get into this. What is a Dry Sump? 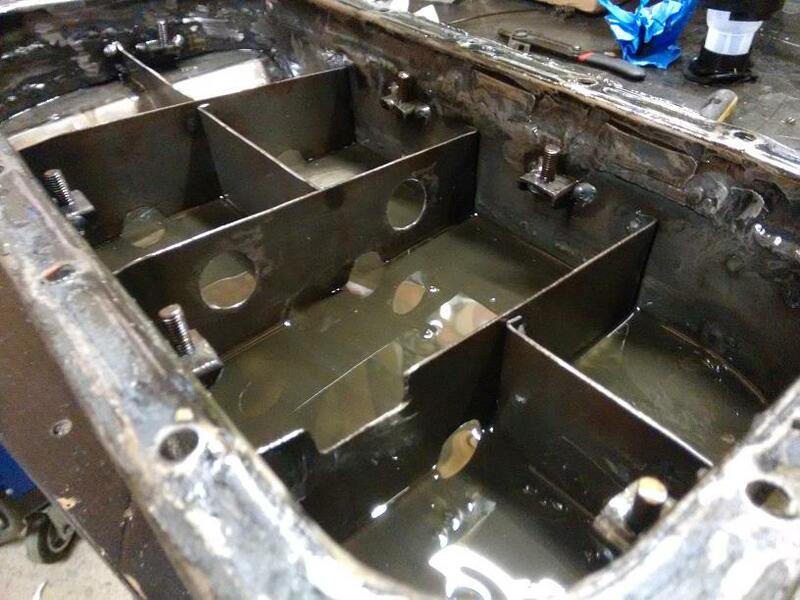 Up until now I have run a Wet Sump on the Locost. 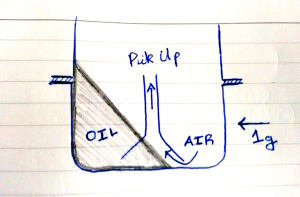 In a Wet Sump system oil passes down into the oil pan under gravity and is fed back into the oil pump via a static pickup. Under longitudinal and lateral acceleration this pickup can become uncovered, leading to oil starvation and heartbreak. 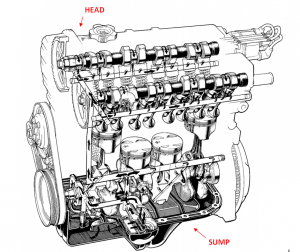 A Dry Sump deals with this problem by running an extra pump attached to the engine; a Vacuum Pump. 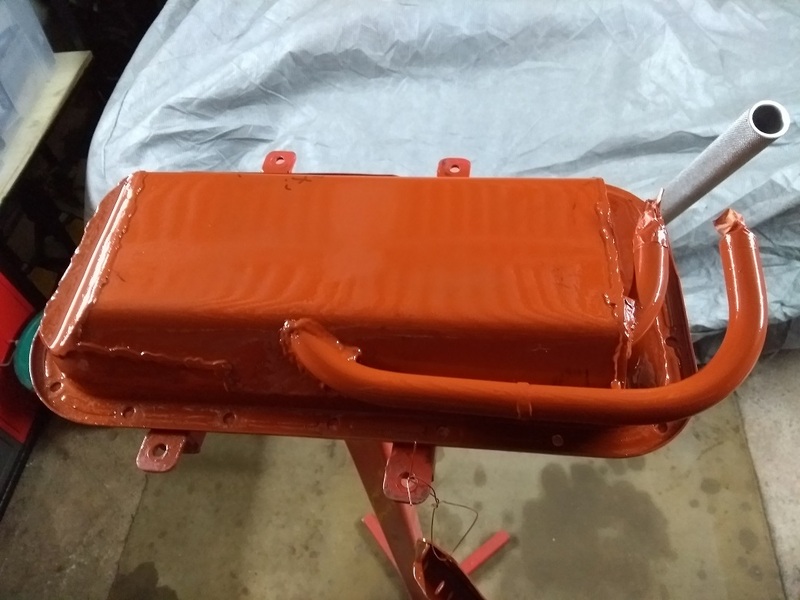 This moves oil from the sump pan to an external tank, which is tall and thin, and much less susceptible to oil starvation. 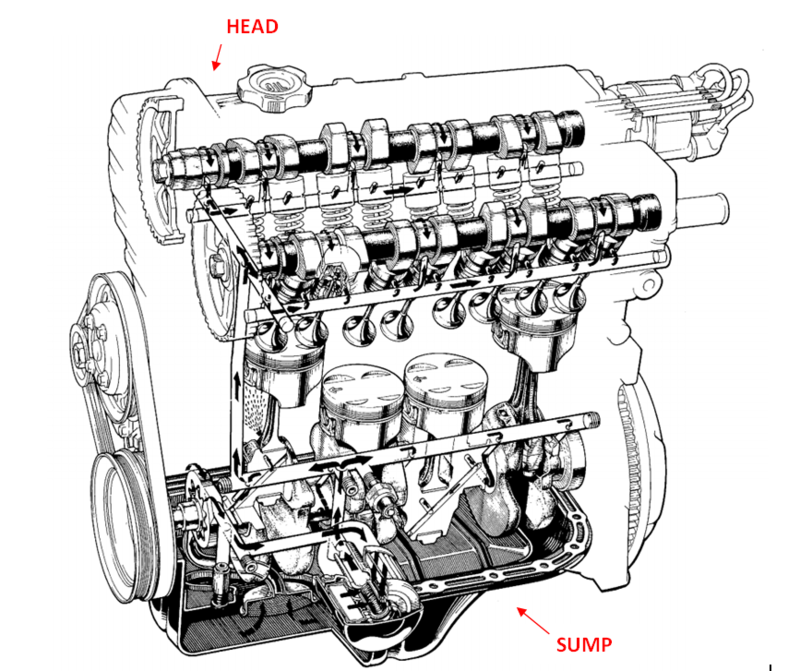 An external oil pump, or the original internal pump, is then fed from this tank; supplying oil to the engines bearings and moving parts. Although I have built a complicated baffled and gated Wet Sump the car still experiences a slow drop off in oil pressure in long right hand corners. I felt it was finally time to take the leap and fix this once and for all with a Dry Sump System. 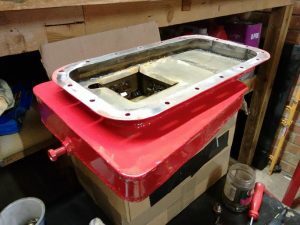 If you still have no idea what I am on about, my previous post covering the build of my Wet Sump is a good place to start (link). 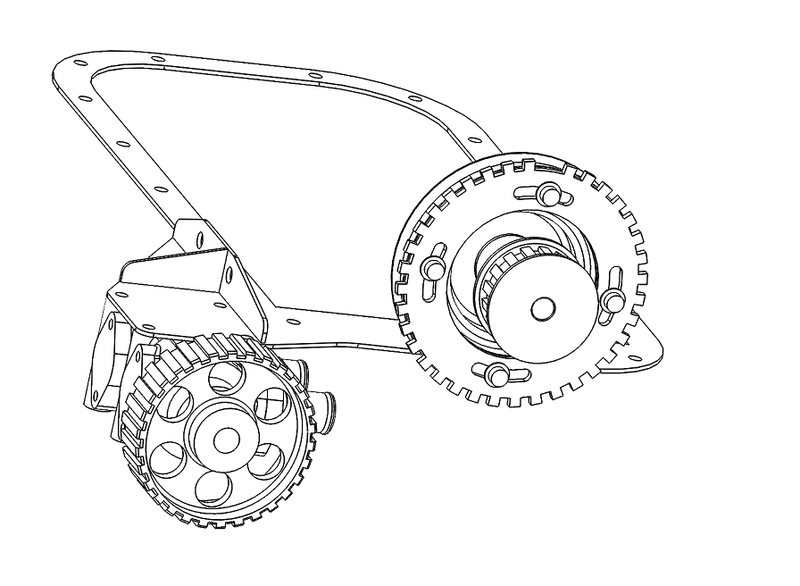 Depending on the oil tank used, it allows constant cornering at a lateral acceleration of up to 5g. 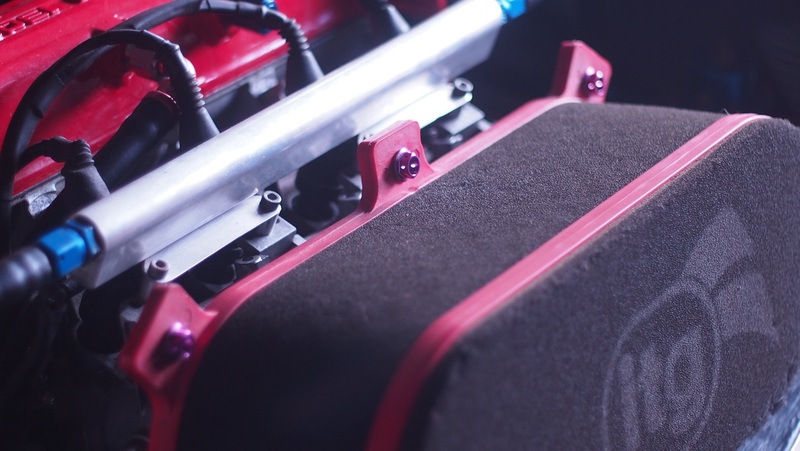 Reduce Windage, increasing engine efficiency at high speeds. 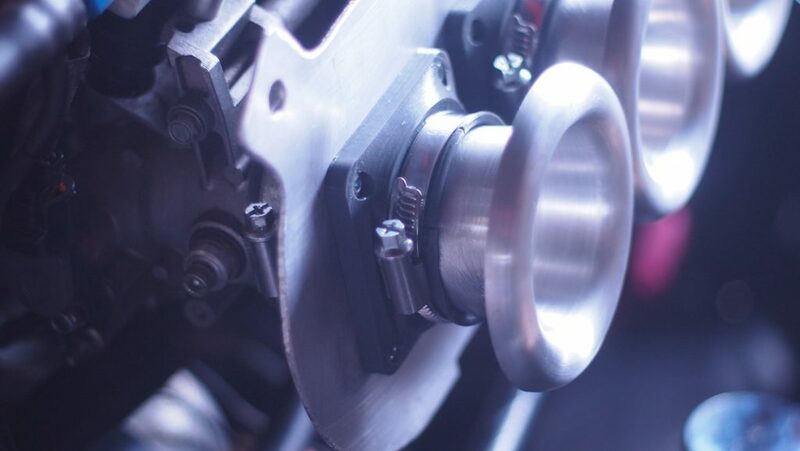 Improve the in-cylinder octane level, as less oil passes by the rings into the combustion chamber. 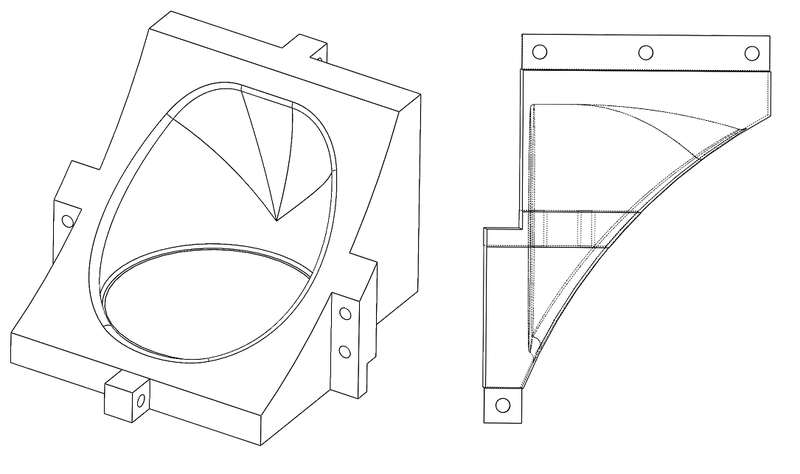 As a Design Engineer I’m trying to do more… Design, when it comes to the Locost. 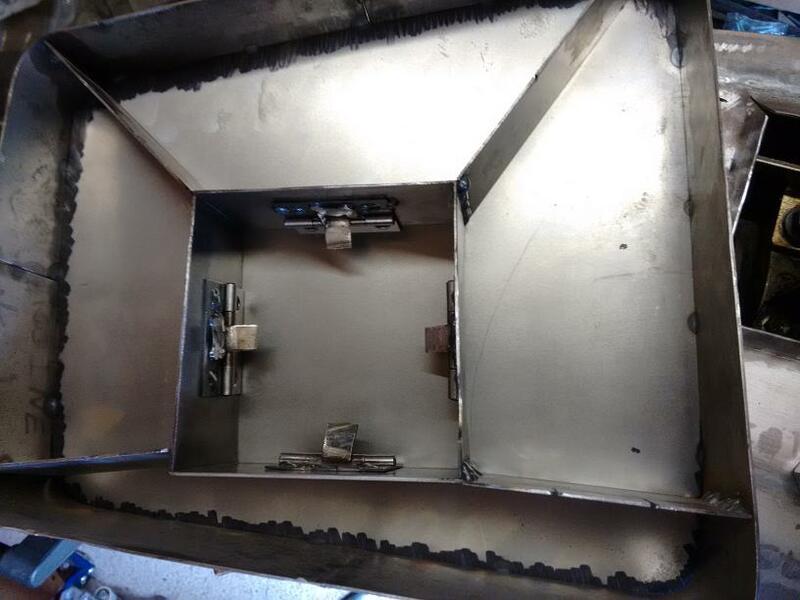 So instead of jumping straight in and cutting metal on day #1, I drew up what the system was going to look like and got an idea of the layout. 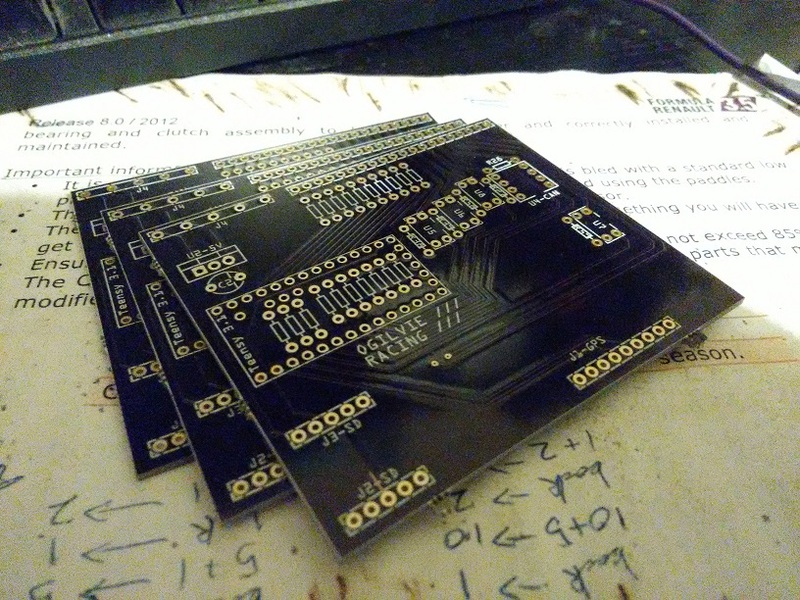 Packaging in the Locost is TIGHT, so this wasn’t ever going to be easy. This was my initial design. I already had a Pace CD2000 Pump that I had bought many moons ago for such an occasion and I modified it into a two-stage vacuum pump, with no pressure stage. 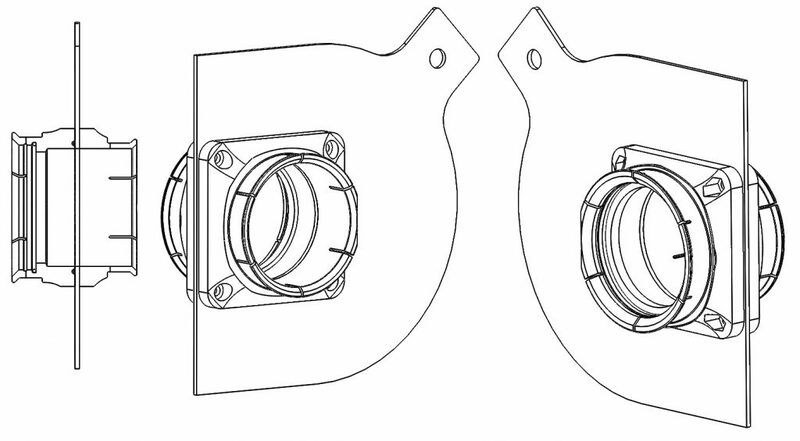 I then used some calipers to measure and get it into cad. 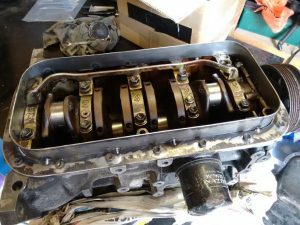 This allowed me put a drive gear on the front of the “engine” (well sump flange and front pulley) and work out the beginnings of the new oil pan. After many evenings and iterations it looked something like above. 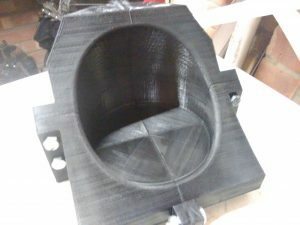 I had decided to use silicone hose for the oil routing between the sump and pump, as it gave many more options in terms of packaging. This mean’t I had to run steel tubing out of the pan. 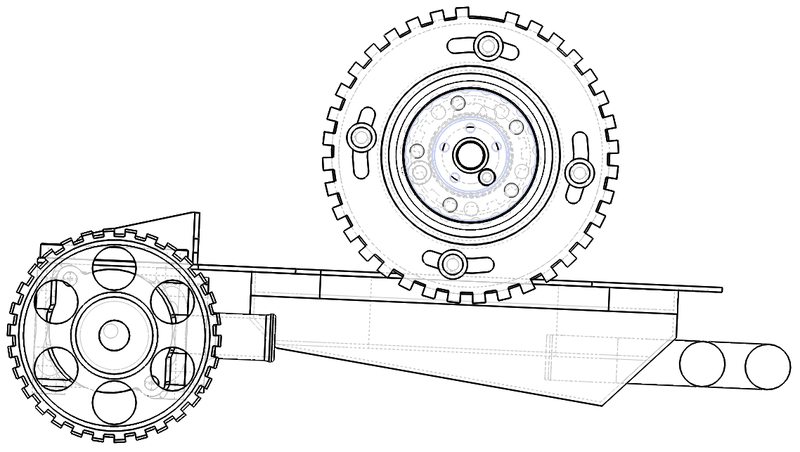 I then finalised the design of the drive-hub and gear. 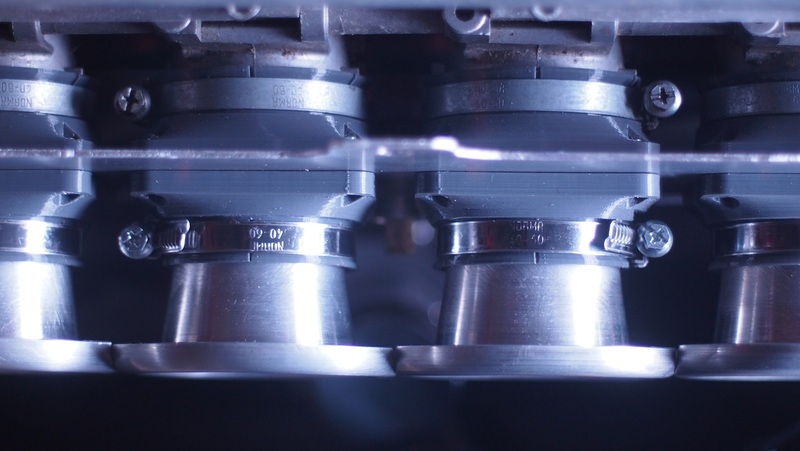 It indexes onto the lower cam-drive and is driven through the five M6 bolts that hold onto the front pulley. 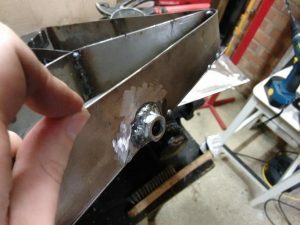 With the component designs sorted I could finally start cutting steel. 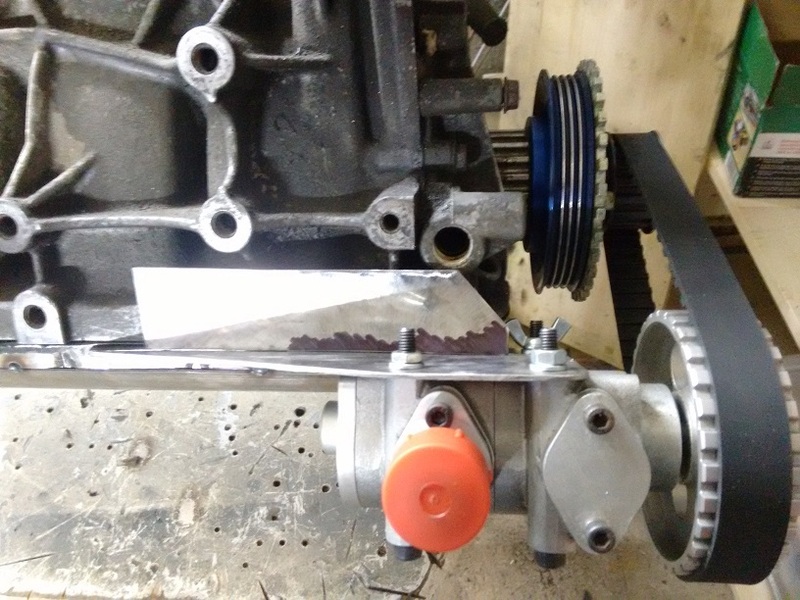 I had a spare standard sump on one of my engines, so I used that as a donor flange. 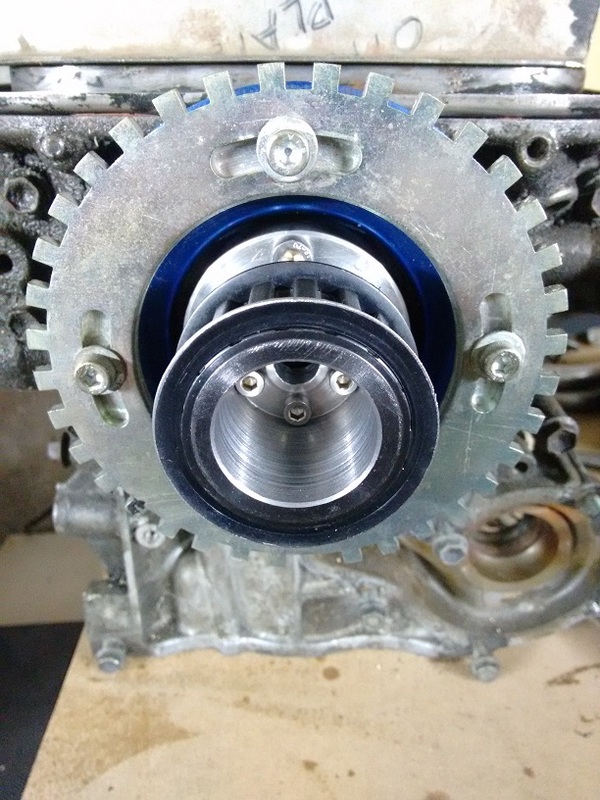 When I built the baffled sump I made my own flange and… it wasn’t as good as the pressed Suzuki item. All the small details really help to seal the gasket to the block and I was happy to carry them over. 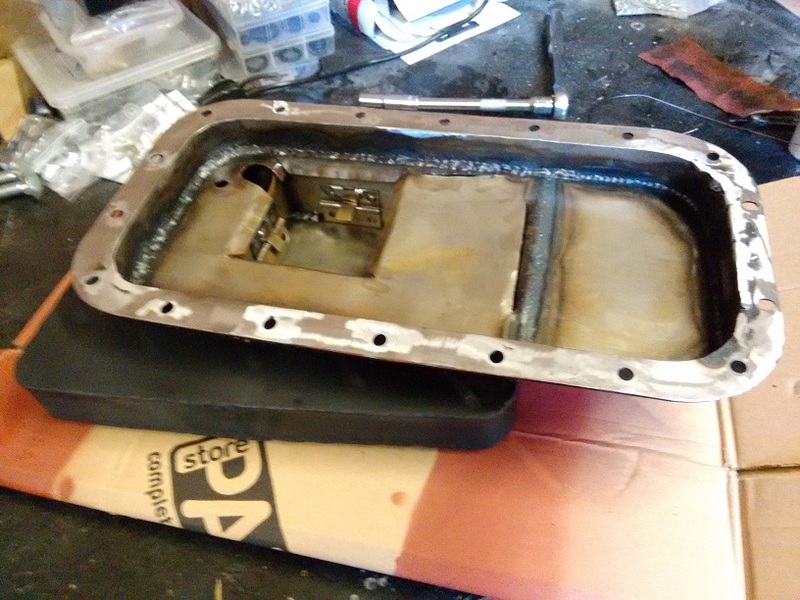 I marked the sump 25mm down from the flange and attacked it with the grinder. 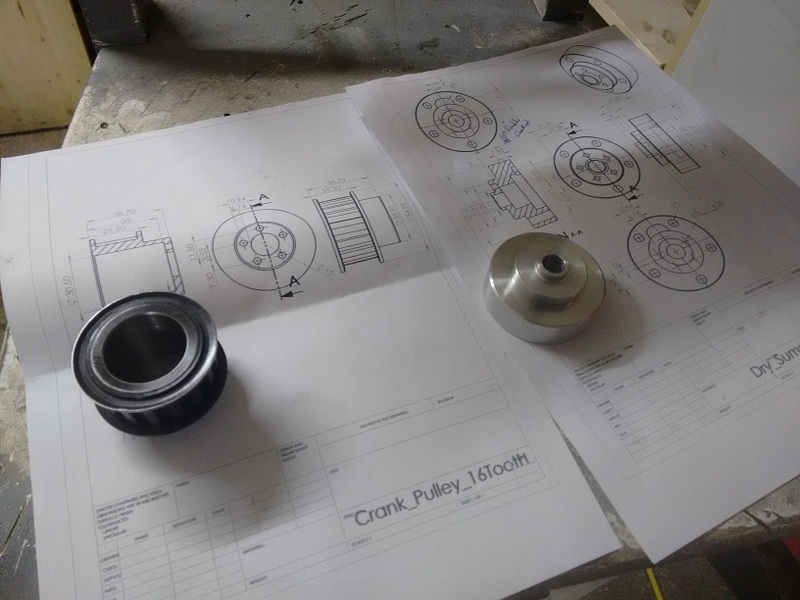 At this point I got my own lathe to help move the project along; achieving a massive life goal in the process! Its only a little Sieg SC3, but it is super useful for making little top hats and smallish components. 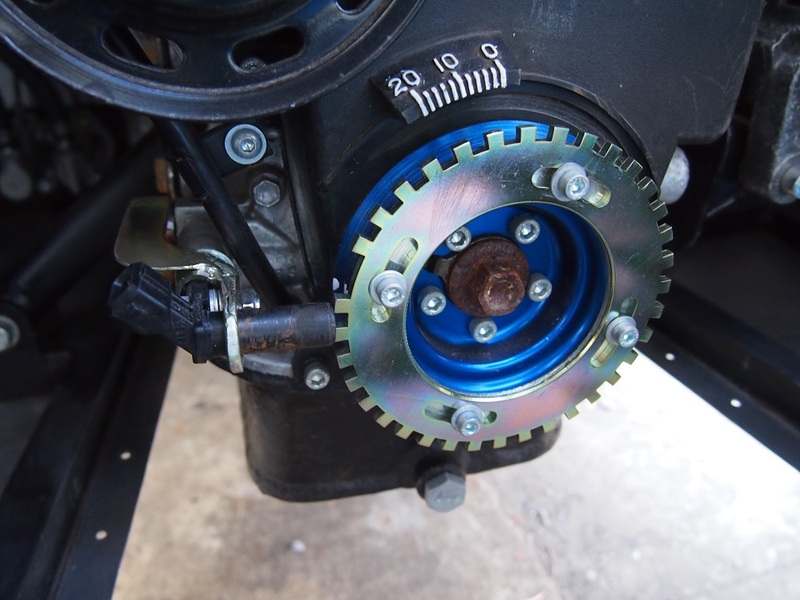 The drive hub for example. 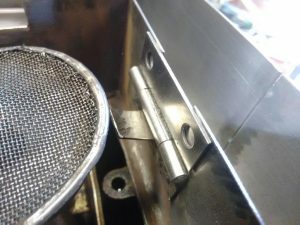 I was able to go from bar-stock to component in one afternoon. 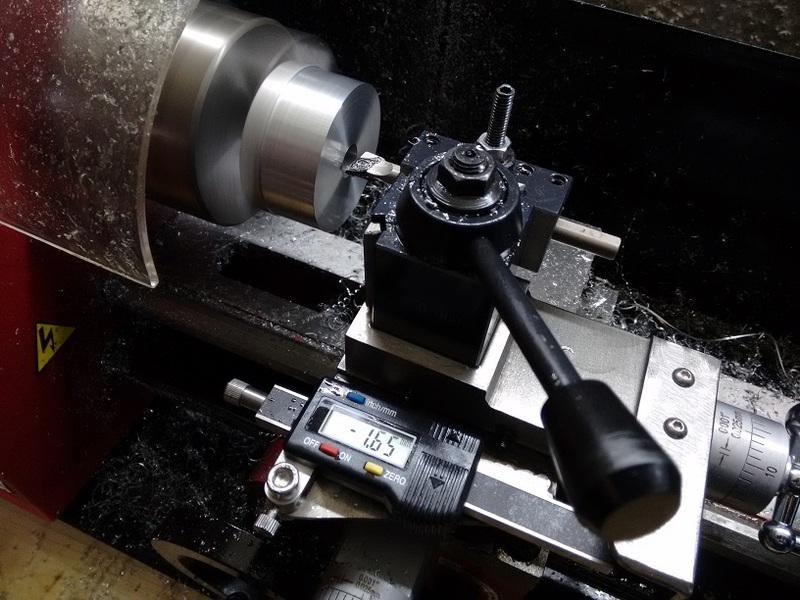 I had made my own digital read out for the top slide which made boring accurate depths super easy. 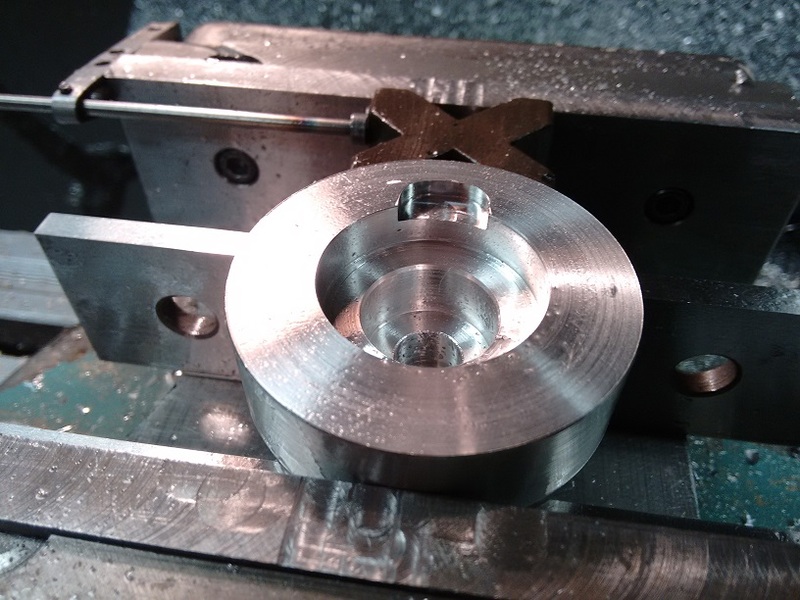 The final features were then machined on the mill. 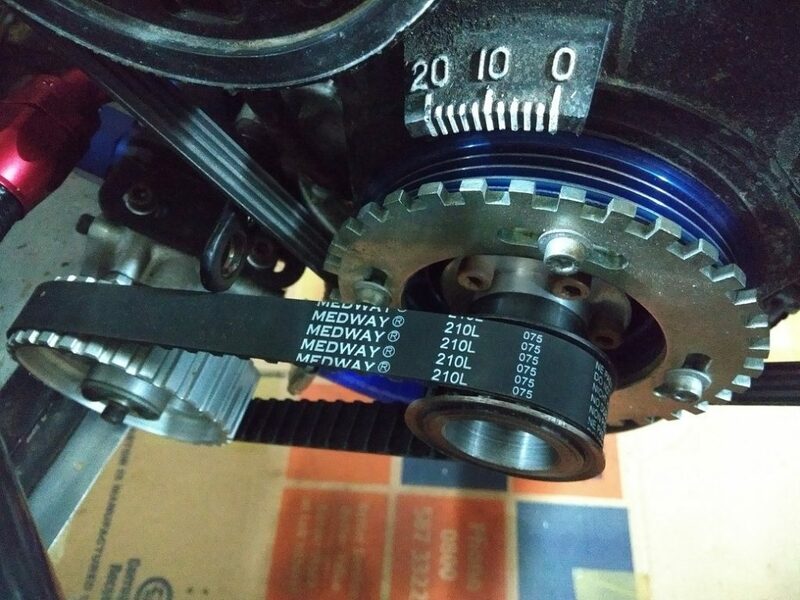 A slot to clear the crank keyway, the five M6 bolt holes and the five M4 gear mounting threads. 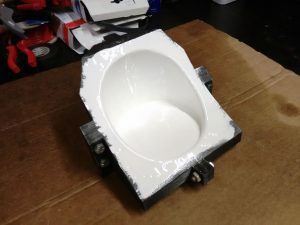 This was what I thought would be the hardest part of the project, but once I used the right equipment to make the components it was actually really straightforward. 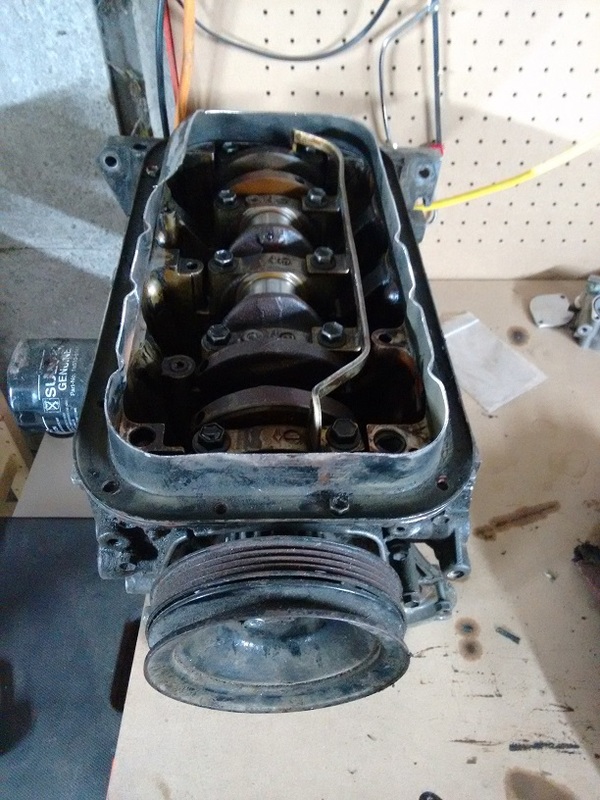 At this point I could properly place the vacuum pump in the real world, choose a belt length, and finish the oil-pan. 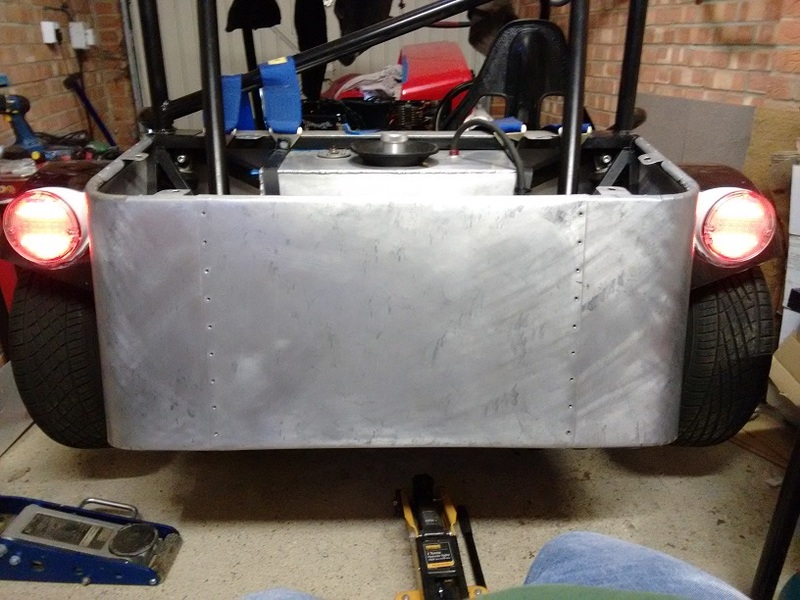 I also added some bolt-in mesh within the sump to protect the outlets. 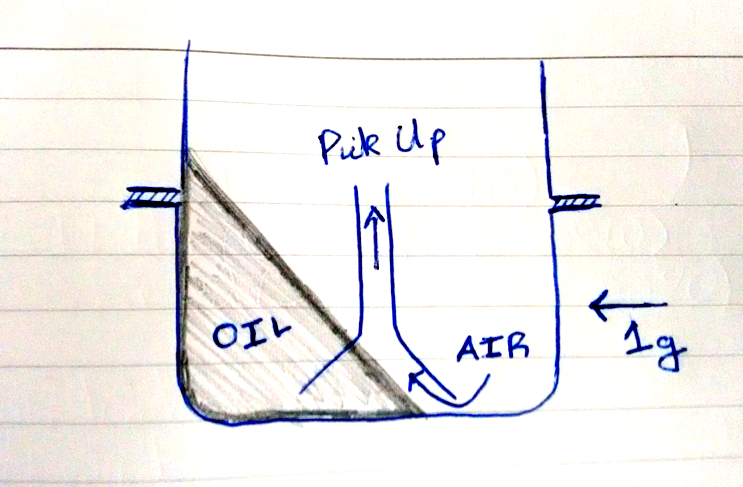 You’ll noticed that I ended up moving one of the oil outlets relative to the CAD. It actually ended up far tighter and better packaged in real life. 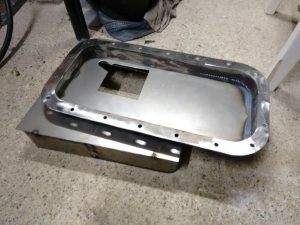 Having made the oil-pan, pump-mount and drive, there were a few small components that needed to be made before I could install the pan. 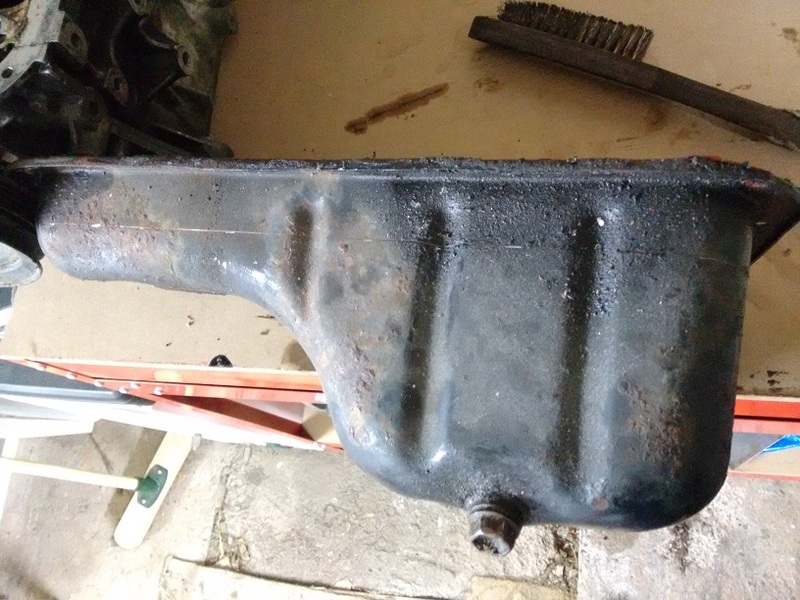 One of these was a bung for the original oil pickup in the engine. 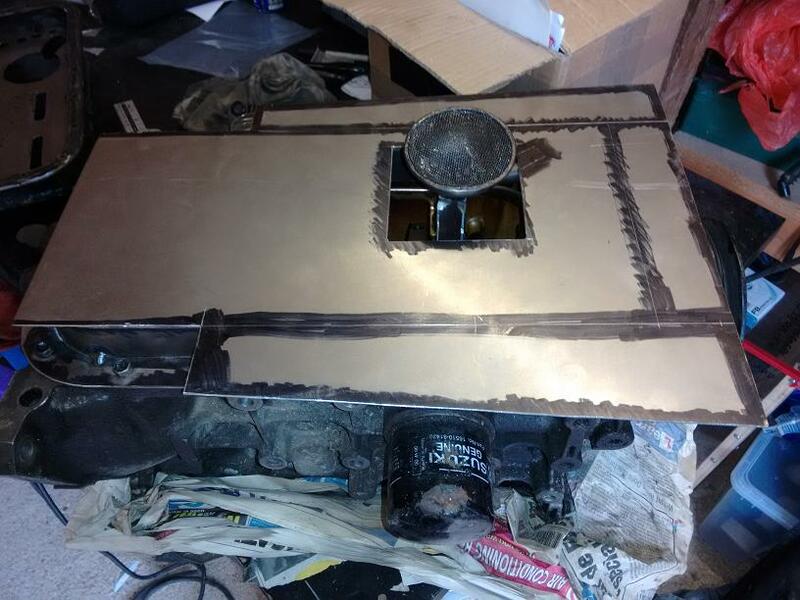 This was essentially a large top hat, bolted in place, allowing the use of the original pickup seal. Following this I could finally install the whole lot in the car. In the final part I will cover the installation of the oil tank and oil lines, and then find out if it actually works! It been a while since I last posted on OgilvieRacing. Life has been pretty hectic for the family since the end of February, and sadly there has not been a whole lot of time for toy cars. In fact the rest of this year is likely to be a quiet one, as I will be changing jobs and location. 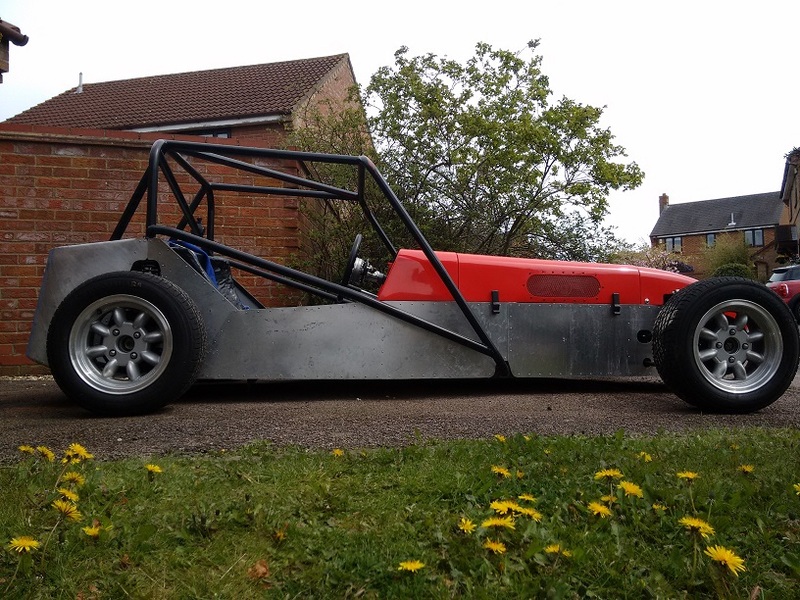 I would like to do a track day at Castle Combe before the end of the year, and I will be sure to fill you in on that and the reliability upgrades I have planned for the Locost. However, I promised a run down of the build up to Snetterton, and that’s what your going to get. Here are some of the many mini-projects that got completed in a time period I like to call: The Six Week Dash. Having molded two rear light pods out of fibreglass (see here for details), I made cutting templates from the cad drawings and made the required holes in the rear arches. The pods’ were then clamped in place and fibreglassed from the back, which would then allow me to blend them in from the front. Given that the rear lights were now positioned correctly I could run the loom from the centre console back to the lights. 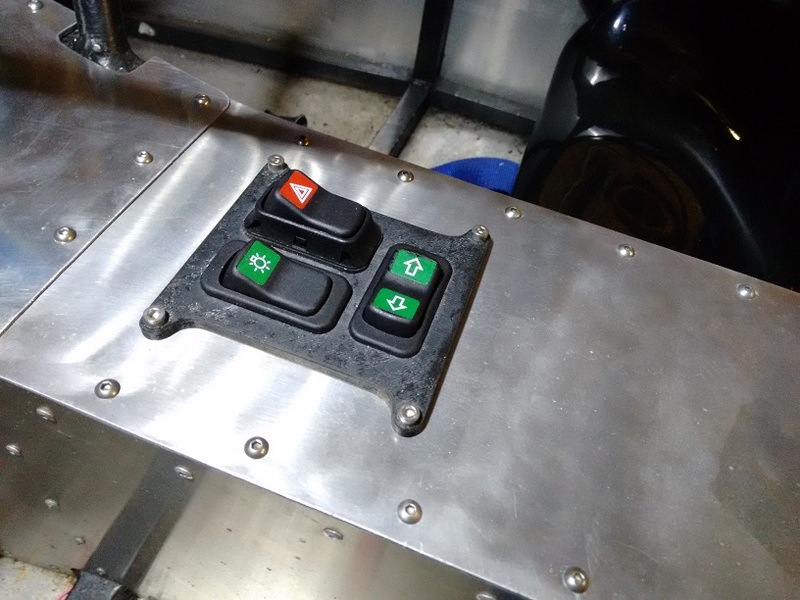 I 3D Printed a little switch panel which mounted to the tunnel and gave me quick access to my light controls without cluttering my vision while driving. It was very satisfying to have the brake lights come on when pressing the brake pedal and seeing the dashboard light-up when the side lights were on. 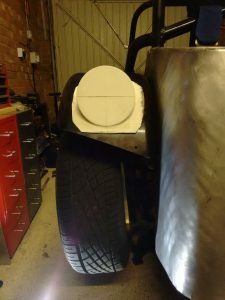 At this point, approximately a week and half into the ‘Dash, the rear arches were put aside. 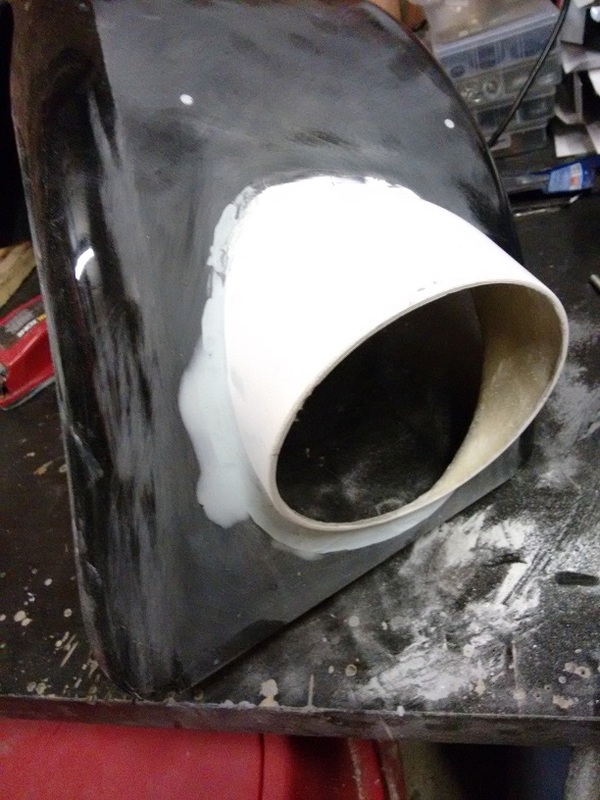 I had really hoped I would have the time to clean them up a little before Snetterton, and the process of adding epoxy-filler to blend in the light pods would make them far stronger and less likely to break. I decided to dig deep in the final two weeks, staying up late and popping home in my lunch breaks to get these blended in and painted in primer. It was worth it because they ended up taking a hammering around the track. Most trackdays do not allow “Open Wheelers”. This is to stop people bringing single seaters and full on race cars to what is mean’t to be a fun day out. 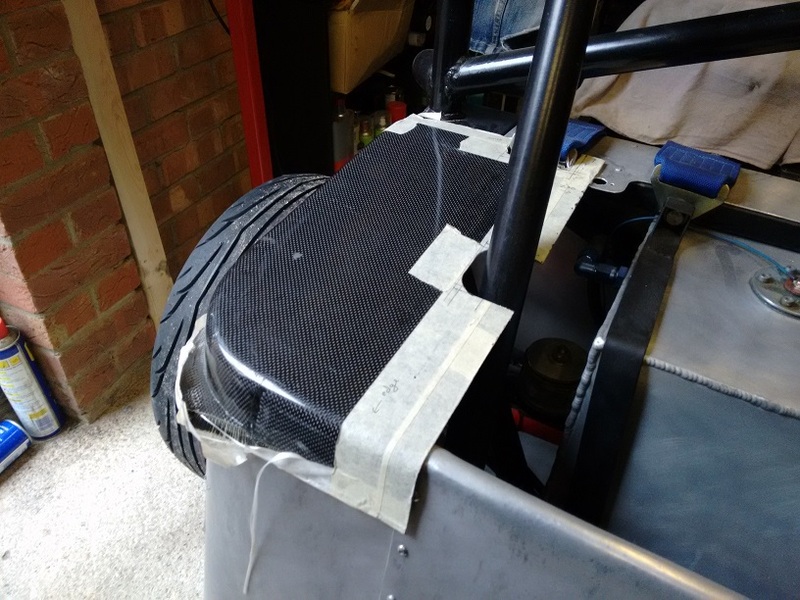 Subsequently you must run some form of wheel arches on all four wheels; so getting the front arches mounted to the car was super-high-priority. 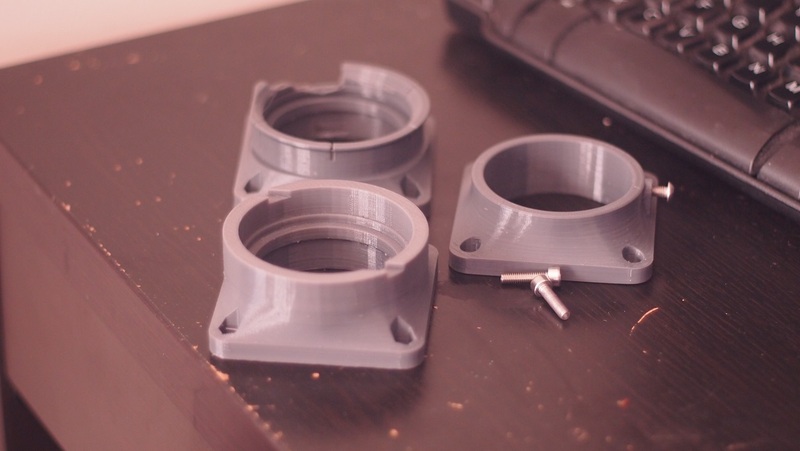 These turned out to be deceptively complicated components to create. 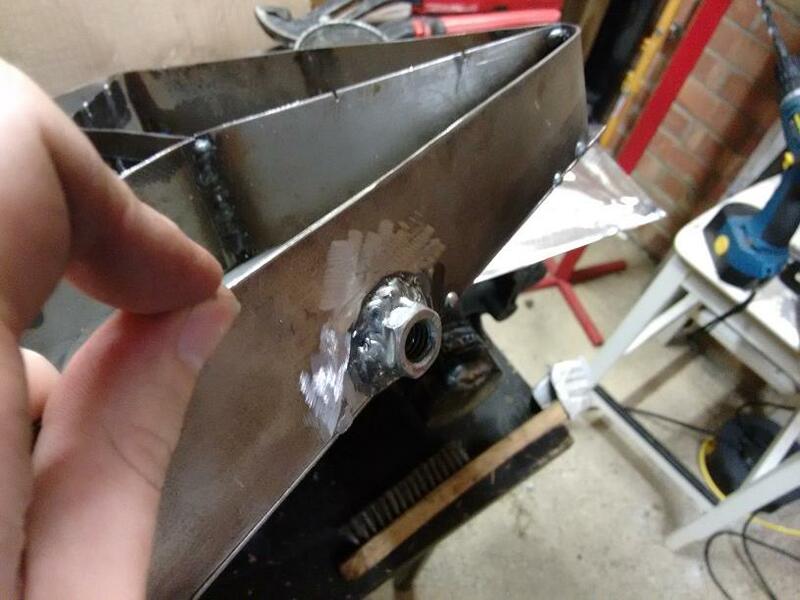 I started by making brackets that mounted to the front upright caliper bolts and tie-rod bolt, to give somewhere to weld tubes too. This required a little artistic flair. The left and right versions of these were made. I then positioned the arches on the wheels, with their own bracket-strips already attached and cut and shaped tubes to join the two together. There was a lot that could go wrong , and positioning the arches laterally and radially on the wheels was difficult; nothing wanted to stay still! In hindsight I probably should have made some form of quick-wooden jig for this, but ultimately the final mounts turned out straight enough. I even think they look good. 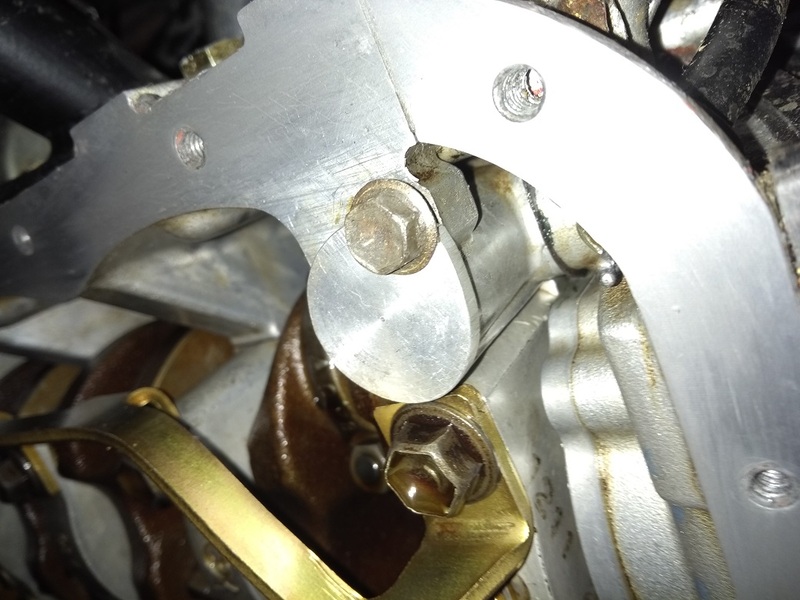 I cut away a lot of unneeded material and ended up using only two mounting points; the top caliper bolt and the tie-rod bolt. 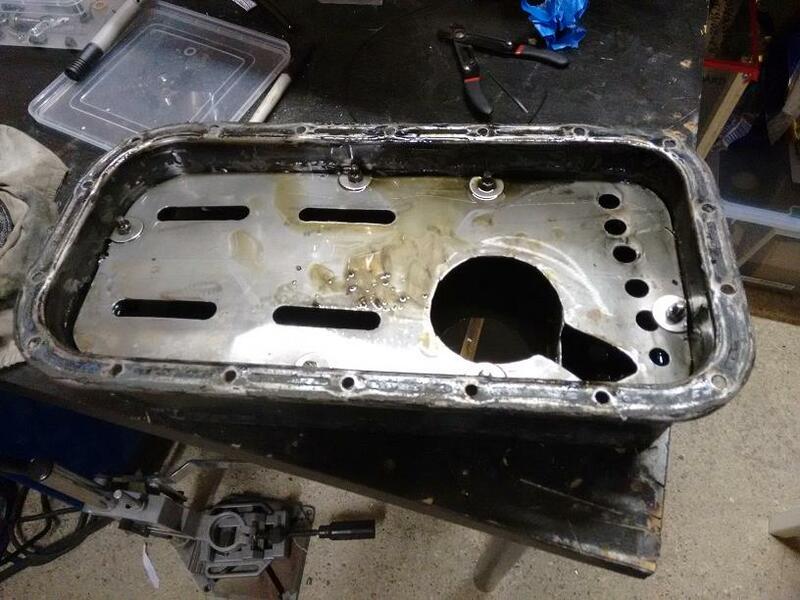 I’m trying to remember how many times this sump went in and out of the car, but due to some form of post-traumatic stress (or my terrible memory) I can’t recall. It was at-least three times. I really struggled to get this to seal to the block correctly and after leaving it for a while and having a proper think, the problem was obvious. 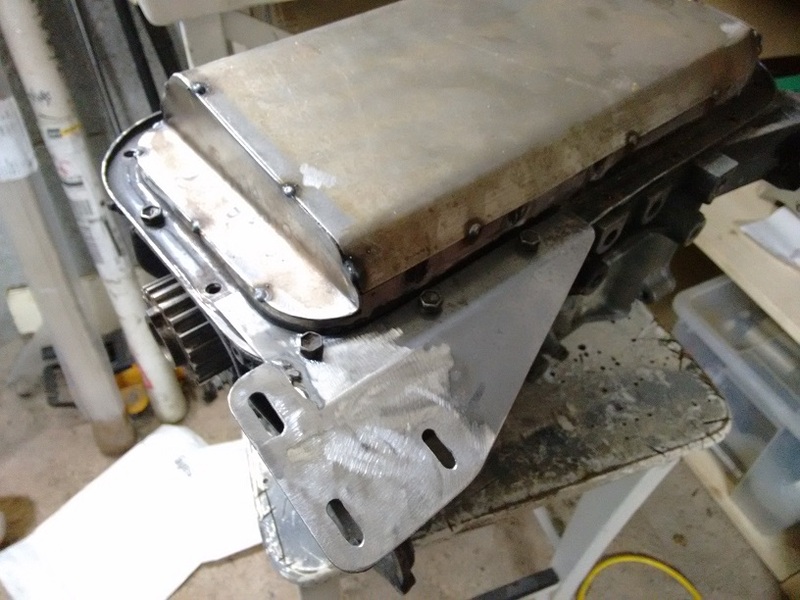 I placed the sump on the relatively flat floor of the workshop and it was clear that it was bowed. 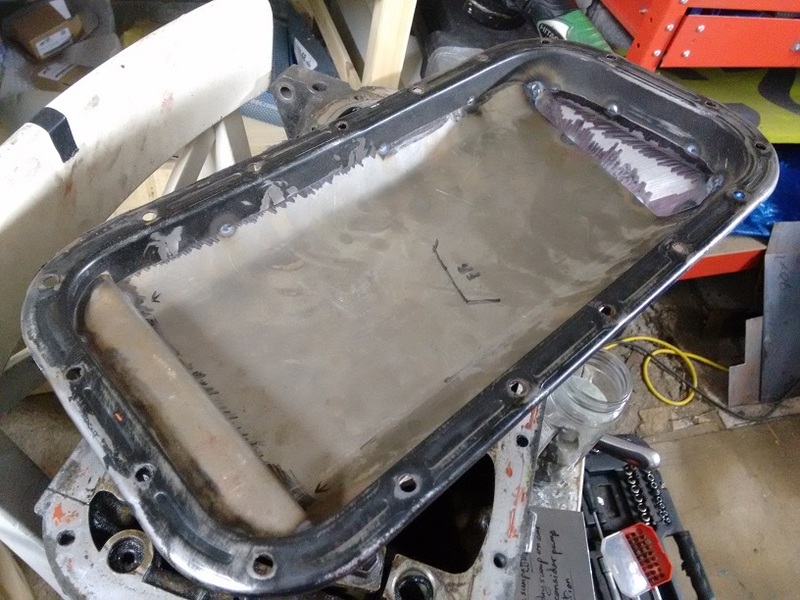 If the front of the sump was going to seal, the rear wouldn’t, and vice versa. 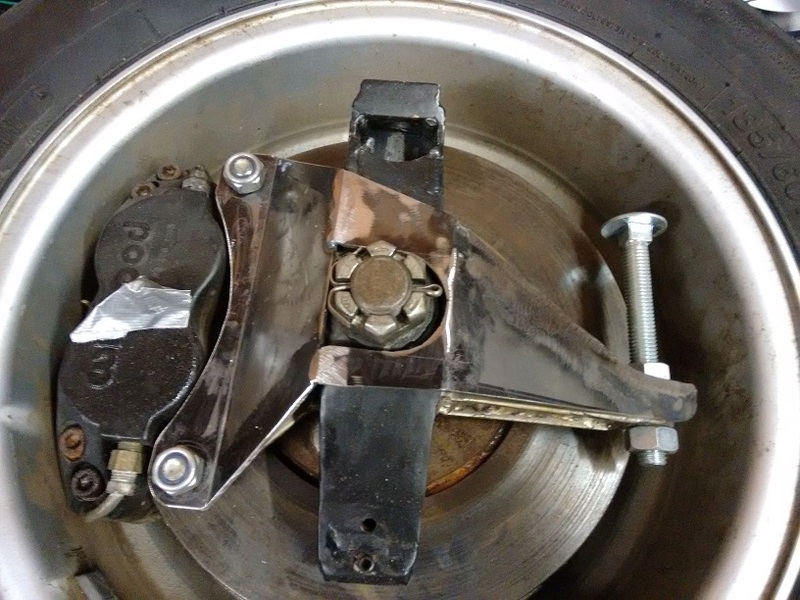 The rear flange was especially bad. 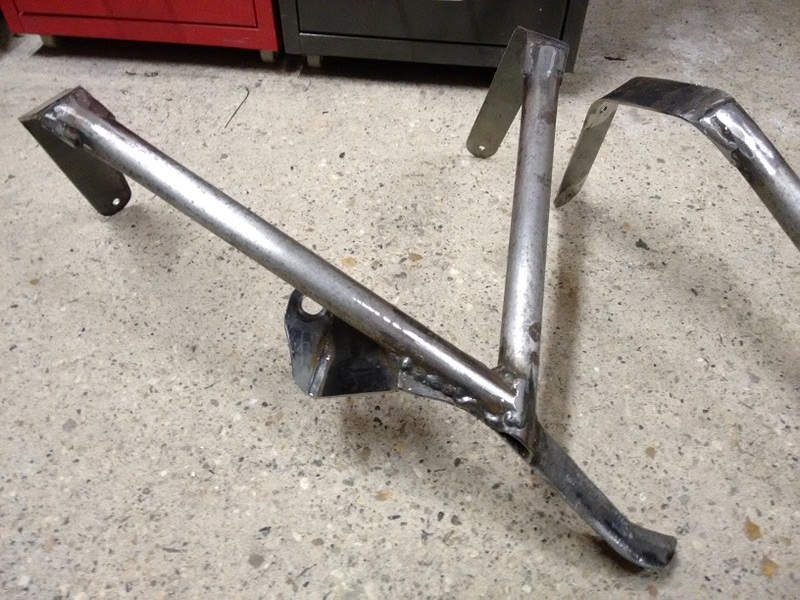 At some point I must have welded it without bolting it down block (doh!). So, as time was starting to get tight (week four of six) I decided I would do the correct thing and hammer the hell out of it until it was flat. I cut, ground, re-welded, added gussets, and did whatever was required to get this to keep its shape. In the end it was good enough for use with a cork gasket and hasn’t leaked since. 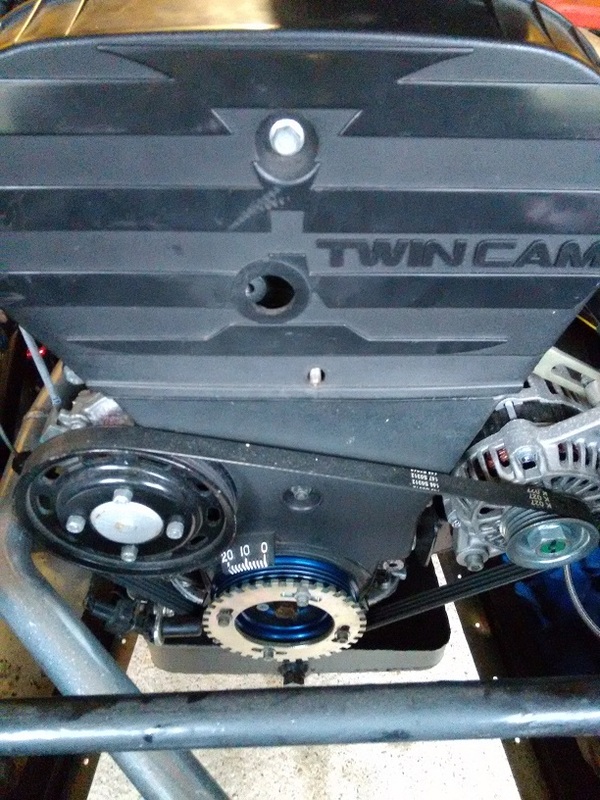 I’m very proud of this piece of kit and it performed well on track, however I think I will eventually install a dry sump for total peace of mind. This has probably been one of the most enjoyable projects I have ever undertaken. I worked as an Analysis Engineer for two years and have really grown to appreciate data, sensors and processing; so to take that experience and apply it to the Locost was greatly enjoyable. In my previous Snetterton post I referred to the data log for each of my runs on track. 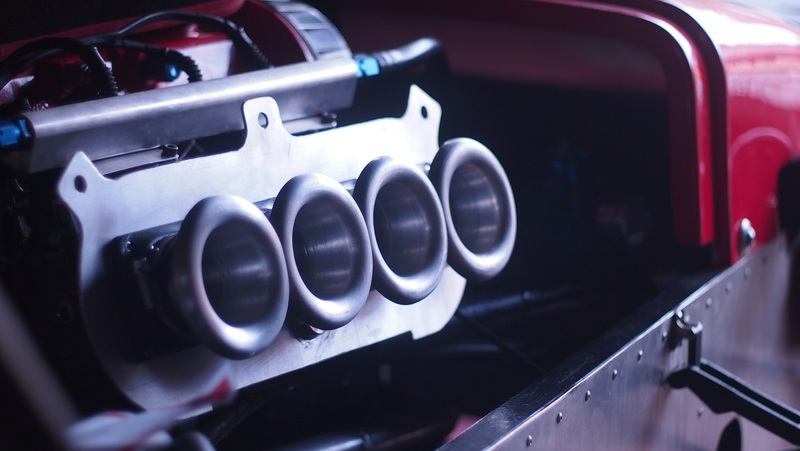 It gave me a another level of understanding of what the car was doing and how the engine was performing. As I add more sensors and systems to the car this is going to become invaluable. The logger was probably not super high priority, but I snuck in an hour here and there throughout the ‘Dash to make sure I got this on the car; I just enjoyed building it so much. 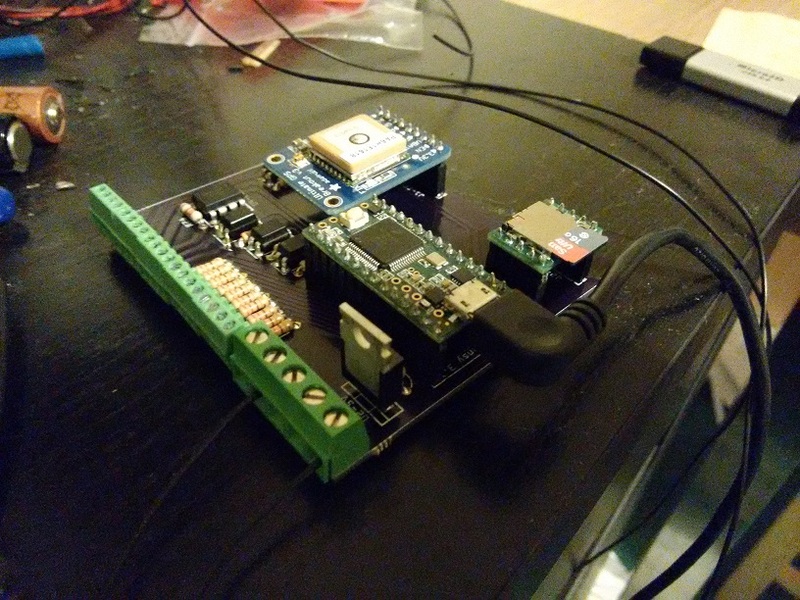 As you can see, this required some Micro-Controller Programming, 3D Printing and Electronic Design; pure engineering bliss. I made sure I got a new set of tyres for the Locost, as the Yokohama A539s were getting on a bit and were as hard as glass. 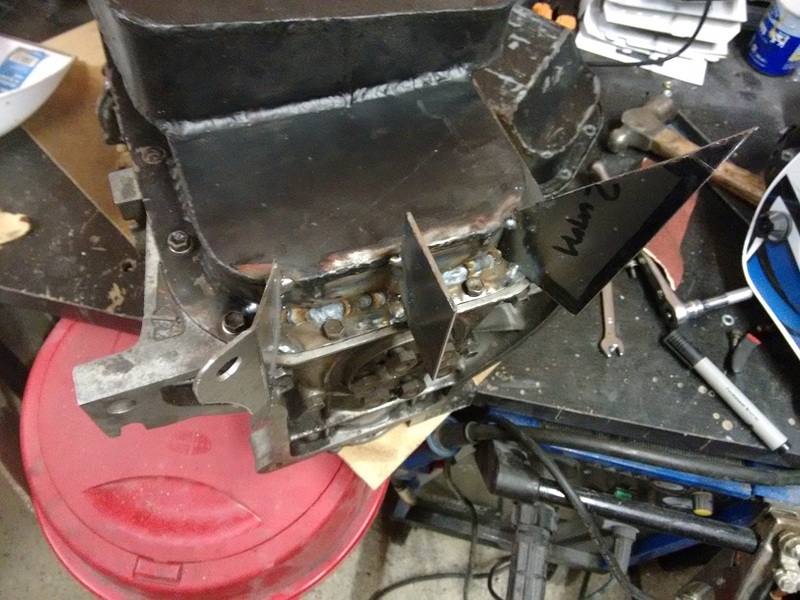 Also having just blasted them with a ton of UV when welding the Front Arch Brackets they weren’t in a good way. 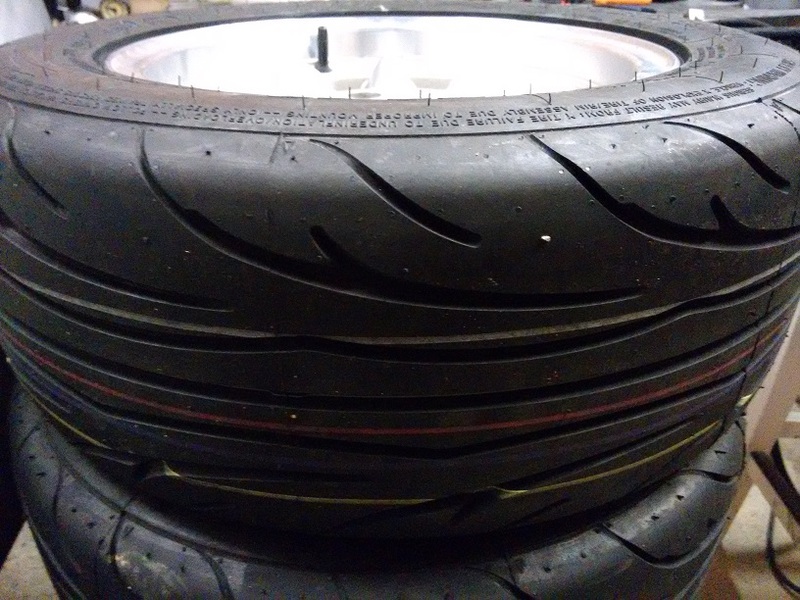 I ordered a set of Nankang NS2R’s and had them fitted by a local tyre shop. Again, this required lots of running around in lunch breaks and burning the candle at both ends. 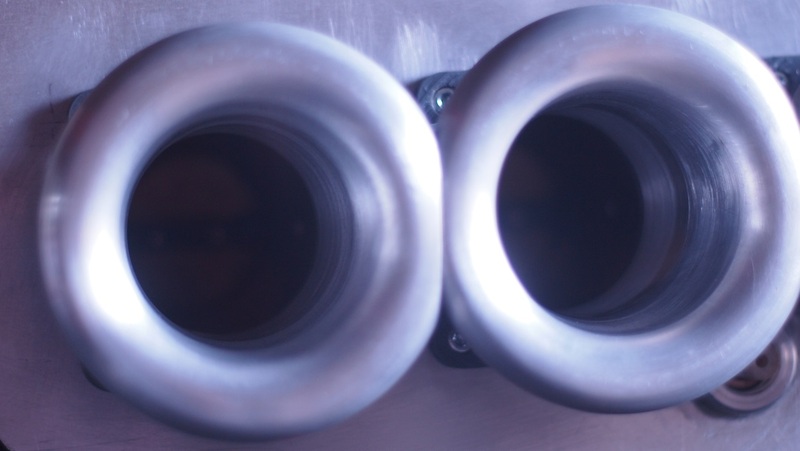 Having only ever driven the car in short sprint-like events it had no real need for a thermostat. 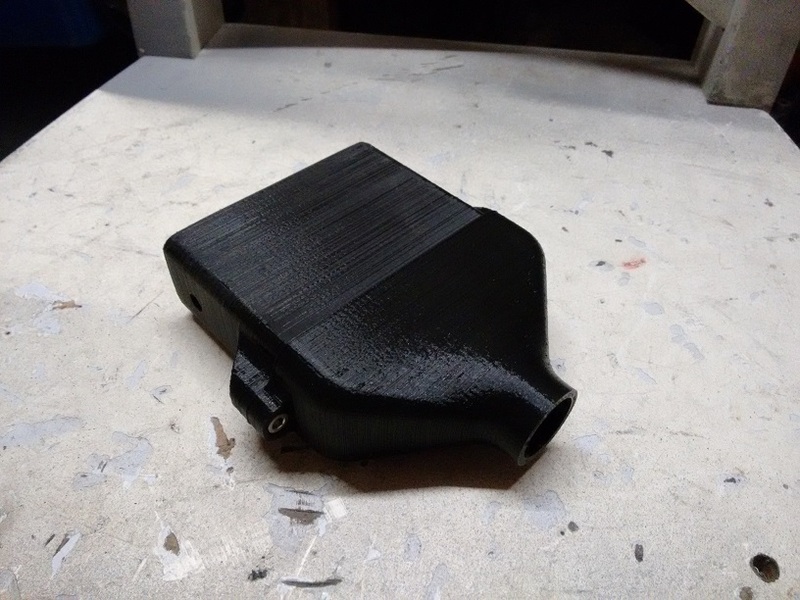 Now that it was going to be doing far higher speeds, for longer periods of time, it needed much better thermal management; so it was important to make sure one was installed. I installed an in-line thermostat in the top hose leading to the radiator; which was probably the easiest job on this list. 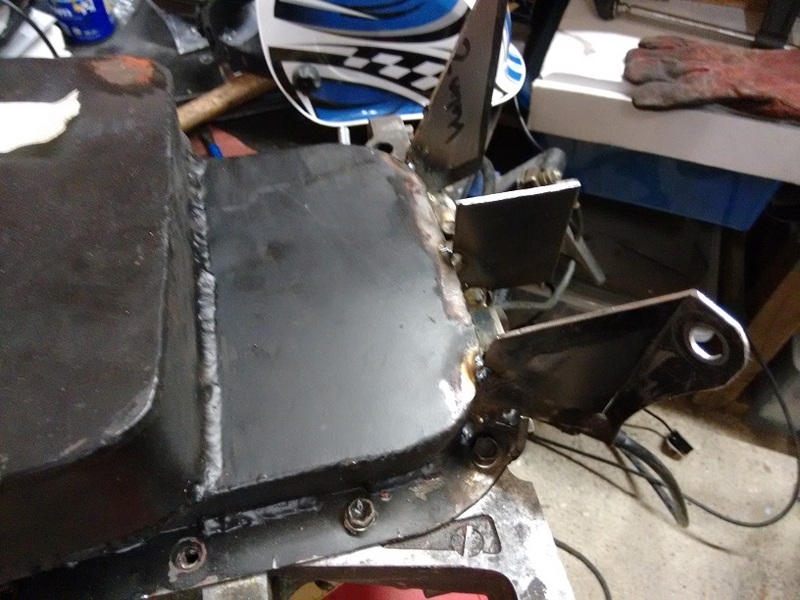 I like the look of it, however I will eventually weld it into the top rail to get rid of one of the flexi-hoses and clean up the installation. 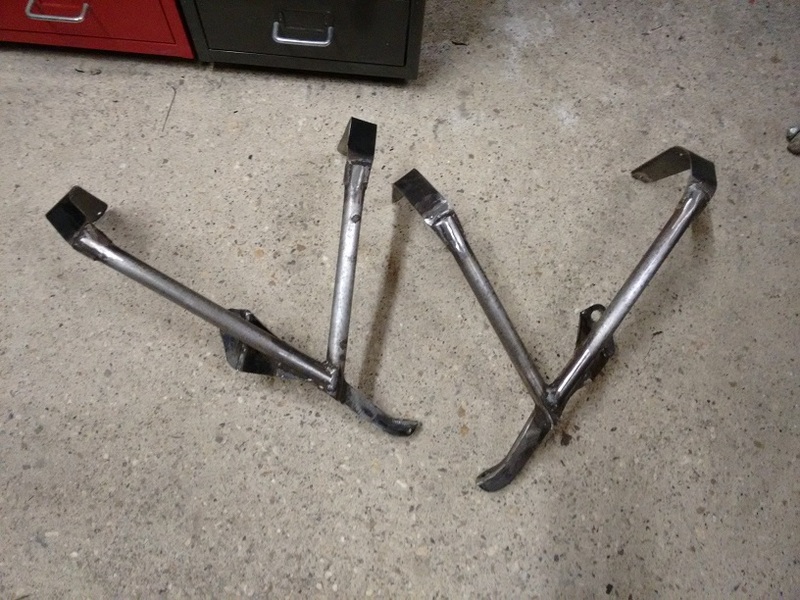 Oh, and I will match the clamps, blergh! 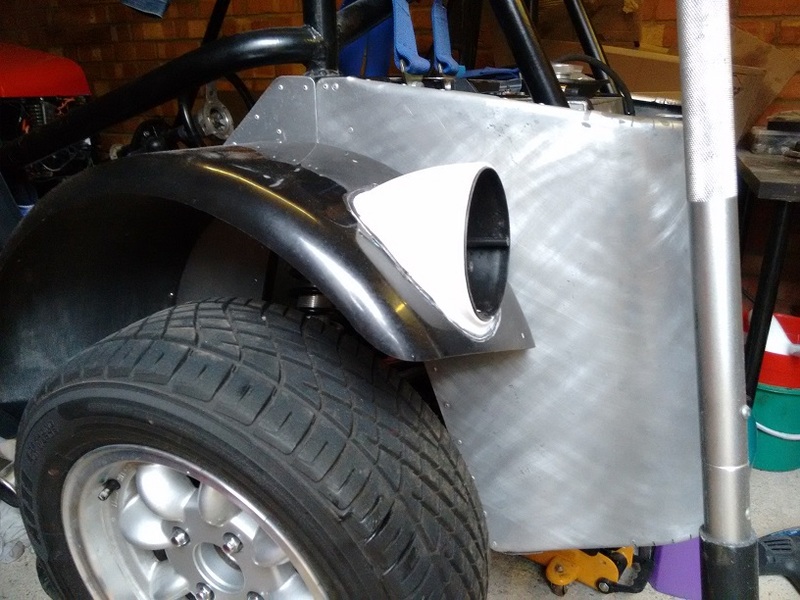 With only two days to go until Snetterton, it was getting rather tight to get the car finished. 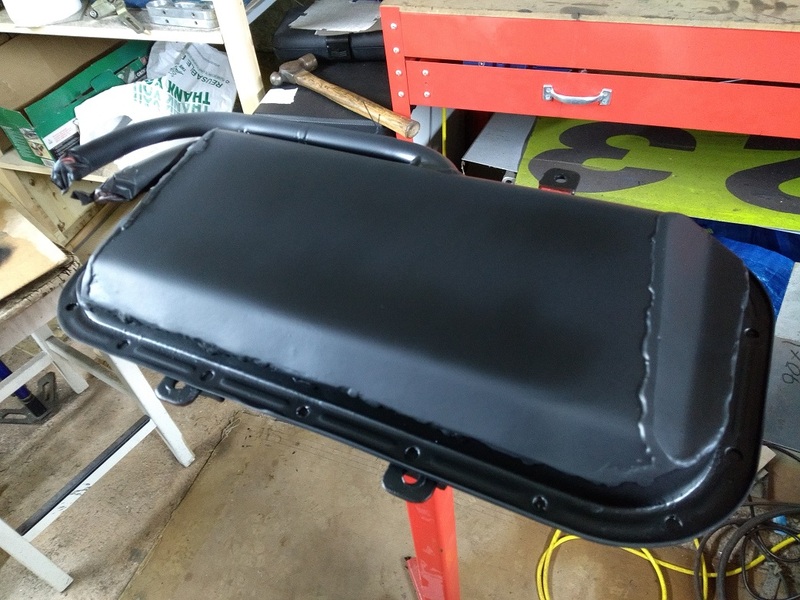 My brother had arrived and was working on installing the passenger seat, which thankfully gave me the time and space to focus on cutting and installing the rear panel. This turned out to be no small job. 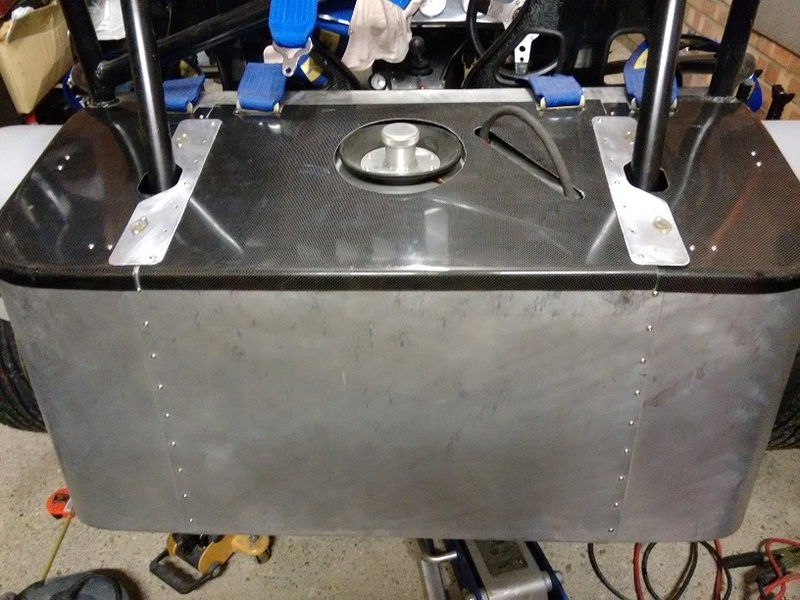 I had budgeted the Saturday to cut the three carbon panels to shape, bolt them in place and add the quarter turn fasteners to the centre. 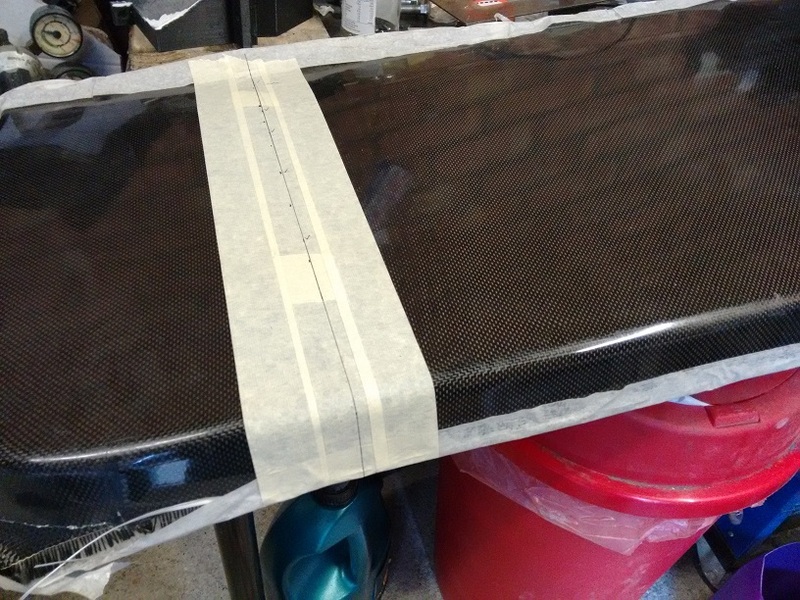 However the carbon fibre blank had tapered sides, so absolutely nothing lined up with the car. 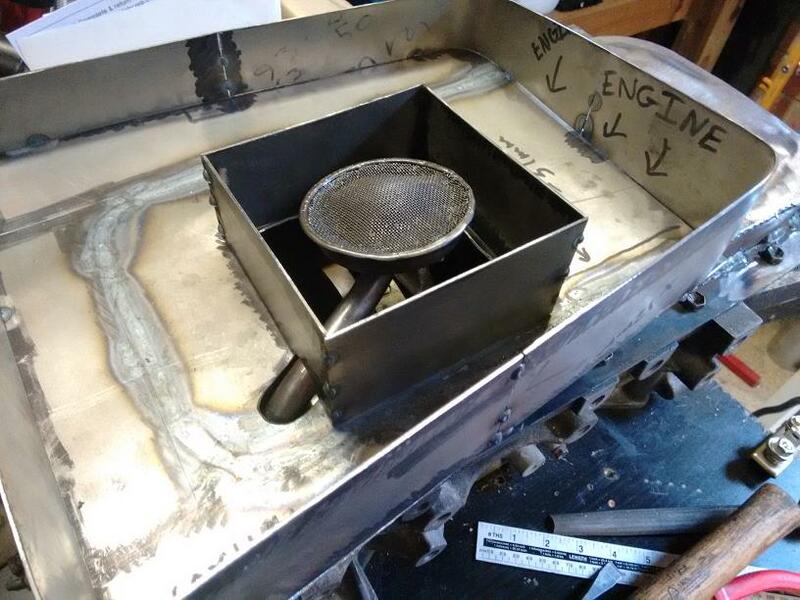 Once the two sides were done it took a substantial amount of measuring and fettling to get the centre section correct. 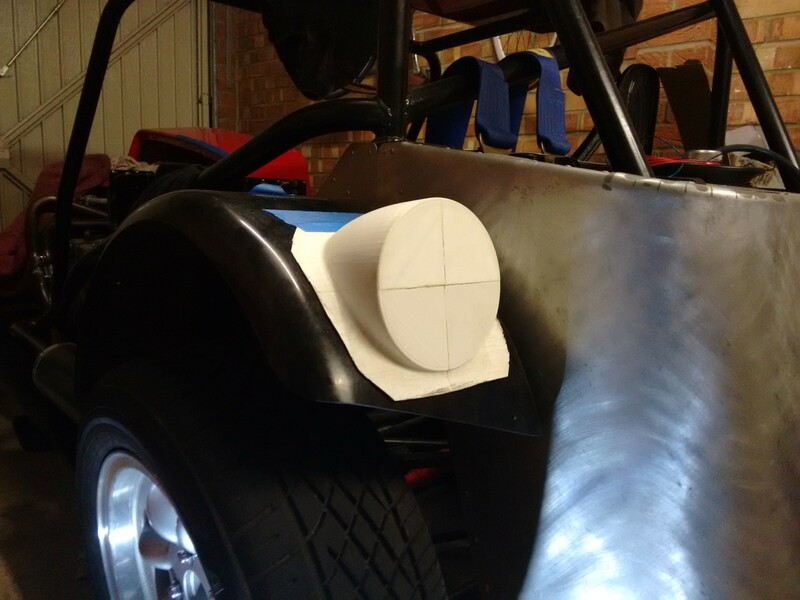 Also fitting this around the seat belts and fuel filler, in a neat and tight fashion, was time consuming. In the end it took me a day and a half, leaving us just enough time to load up the car and get some sleep. I was fairly broken after doing all of the above, and I have appreciated a short break from the workshop. The Locost has come a long way in the last twelve months and I’m proud of what I have achieved so far. In-fact, almost exactly a year ago I rolled it out into the sun in full light-weight AutoSolo trim, to get the engine up to temperature and give it one last blip before pulling it apart. 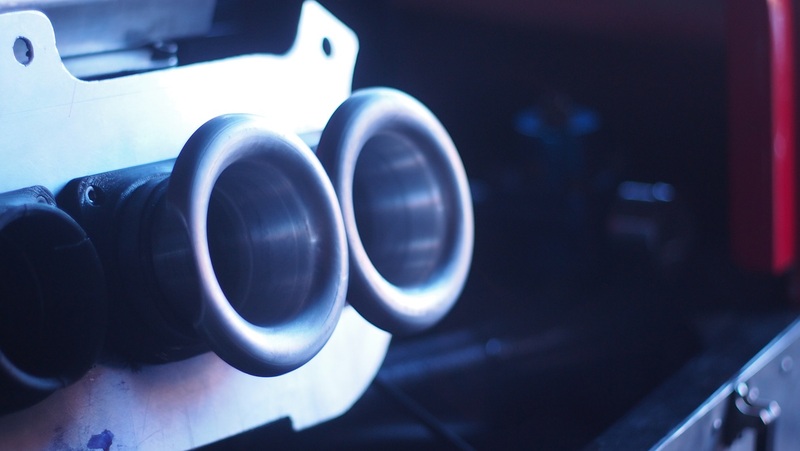 To trackday a car it needs a reasonable level of illumination, to communicate your intensions and make yourself more visible in low light conditions. Indicating left, pass me on the right. Hazards flashing, I’ve had a bad day. 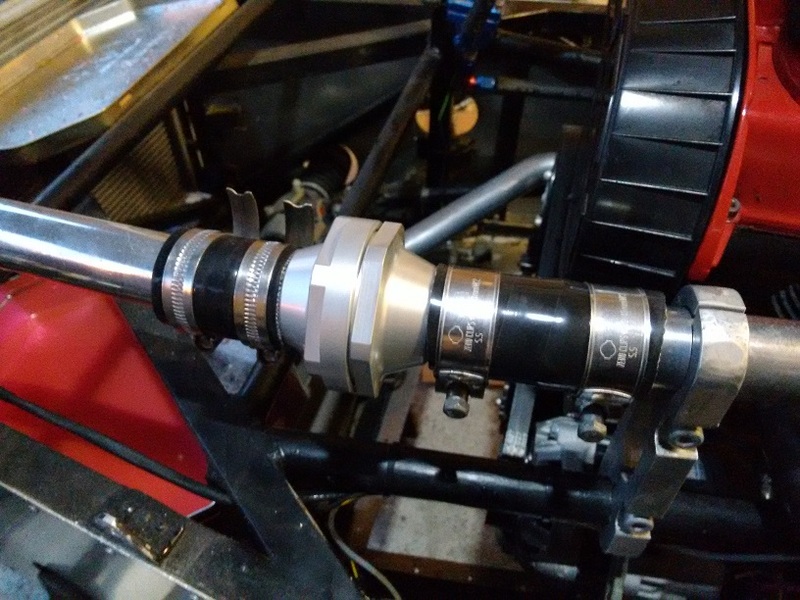 This is something the Locost has not needed until now, as it has only ever been driven on closed courses with only one car competing at a time. I already own a set of rear light clusters that I bought almost six years ago when I was initially stockpiling parts. I decided to go with these “hamburger” style rear lights as they mirror the round headlights at the front of the car, that I am also yet to install, and also I could get them with clear LED’s which would keep the car aesthetically pleasing. It also helps that they weren’t cut-off-your-left-leg-and-right-arm expensive. 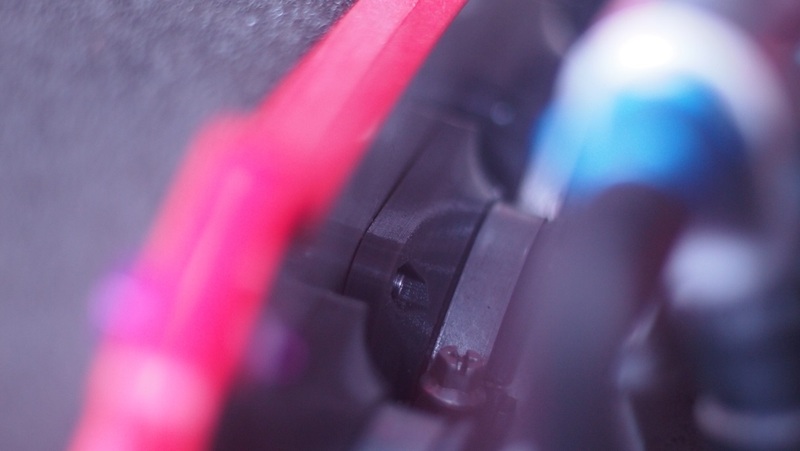 The easiest and quickest place to mount rear lights on a seven is directly to the rear bodywork. While this could have been done on a Saturday afternoon, with time for a few cups of tea in-between, it would have been almost irreversible and completely illegal for road use if I ever felt like going that way (lights must be a maximum of 100mm from the outer most bodywork). 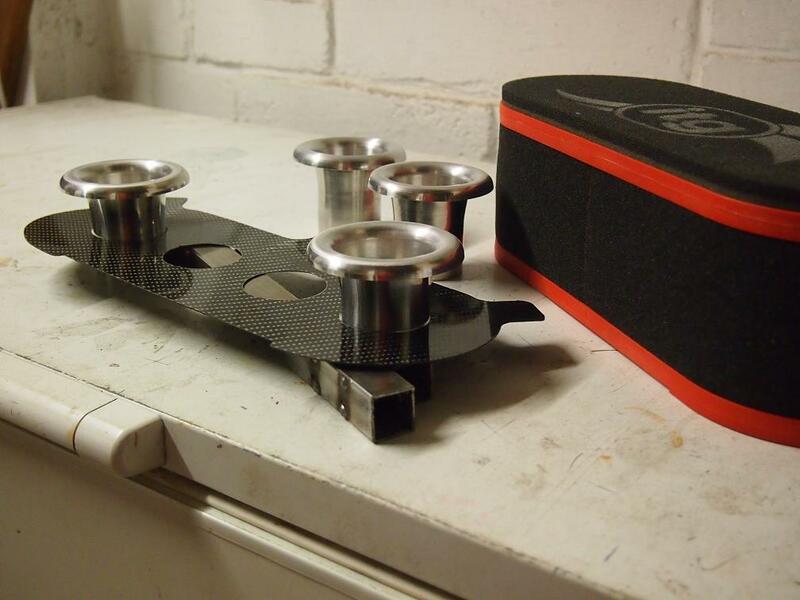 So this left me with only one option which was to mount them on the rear wings. 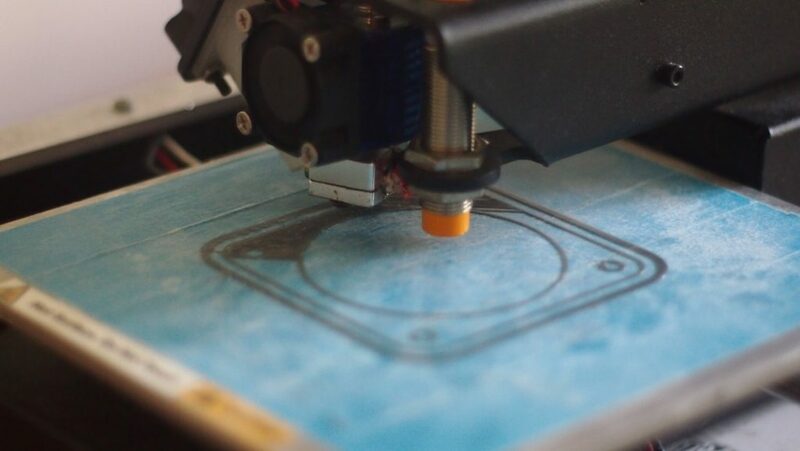 Never one to turn away the opportunity to do something the hardway I decided this would be a great opportunity to make my own light pods, in my own asthetic style- fire up the 3d printer! 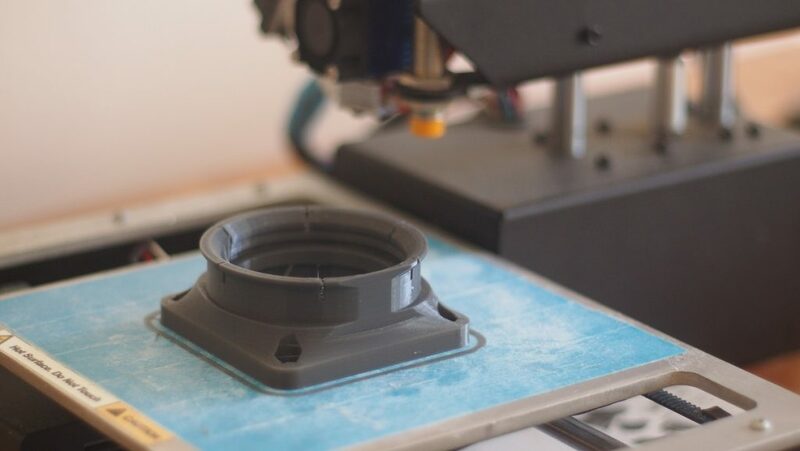 First of all, my printers build volume is a measly 150*150*150mm, and would have never been able to print an entire light pod in one go. Also, PLA plastic would have never been a good choice for components like this, given that they will sit in the sun for extended periods of time (damn you 60degC glass transition temperature). These would have had to have been printed in ABS. 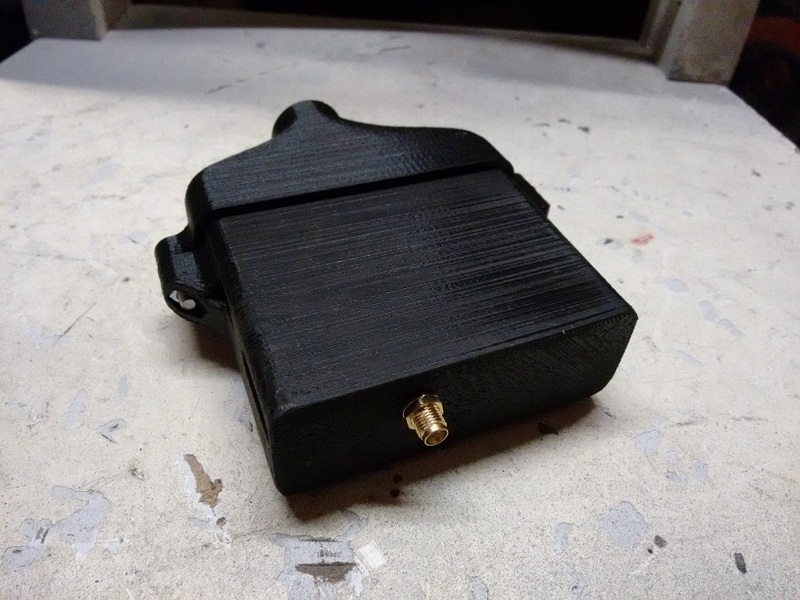 Printing thin walled ABS shapes is pretty much a no-go without some major warping, so this left me with only one option… a 3d printed mould. I grew up around fibreglass in all its forms. Quick shabby make-a-mould-out-of-Tupperware fibreglass, and top quality a-thousand-layers-of-wax-and-lots-of-polish fibreglass; this was going to be something in the middle. 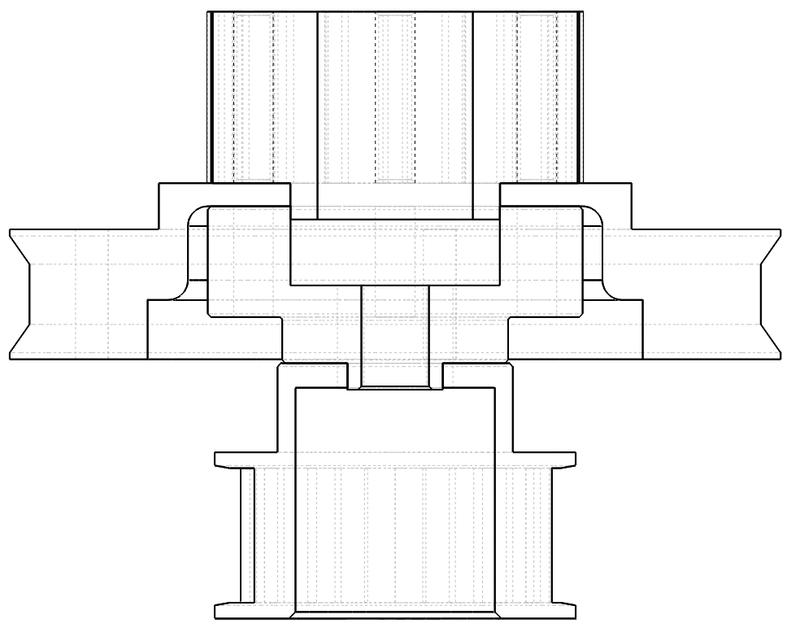 Because of my limited build volume I opted to design the mould to split into four separate parts. This also meant that releasing the strangely shaped light pod would be relatively straightforward as long as everything was unbolted and persuaded a little; so it was win/win. 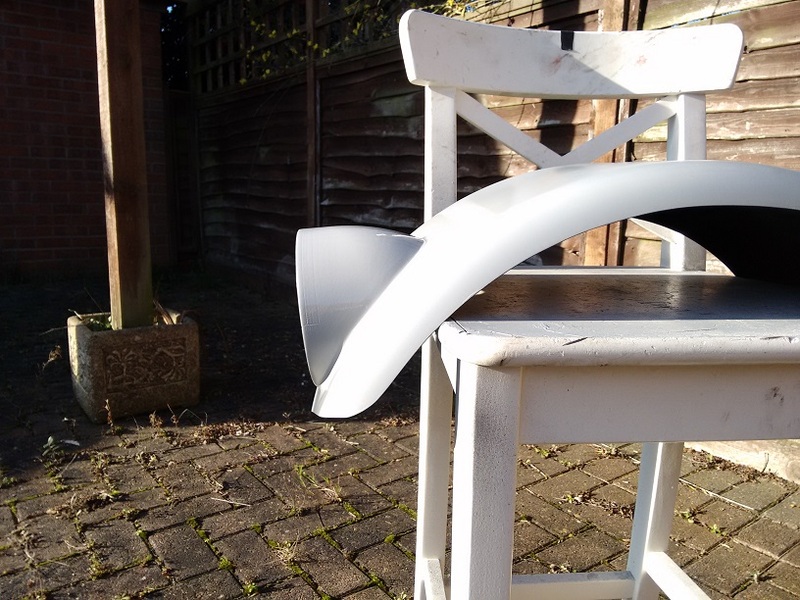 After measuring the curvature of the rear arches and the geometry of the lights I frew the mould itself and split it in the X and Y axis. This is a female representation of the lightpod, with the reverse being the actual “male” final piece. 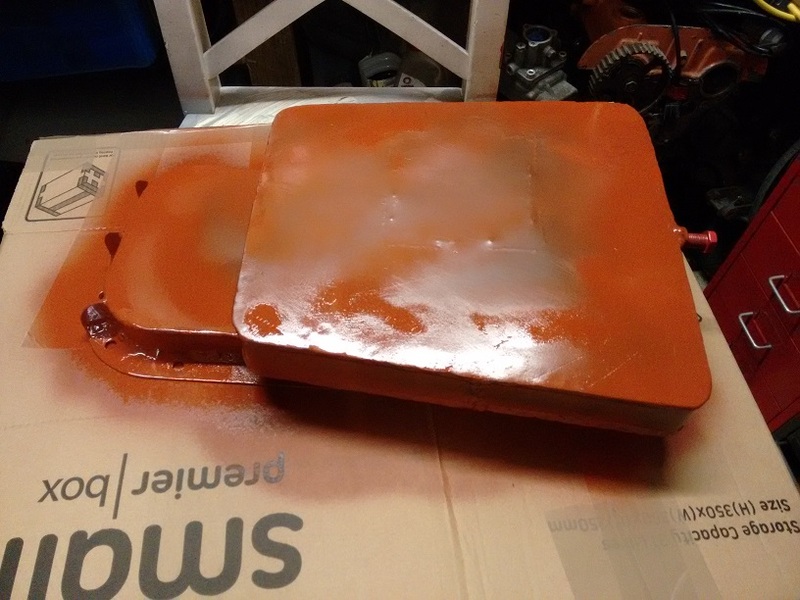 Getting a clean striation-free mould surfce was going to be unlikely, and comes with the territory when 3d printing, so I knew I was going to have to sand and polish the final mouldings after they were produced. 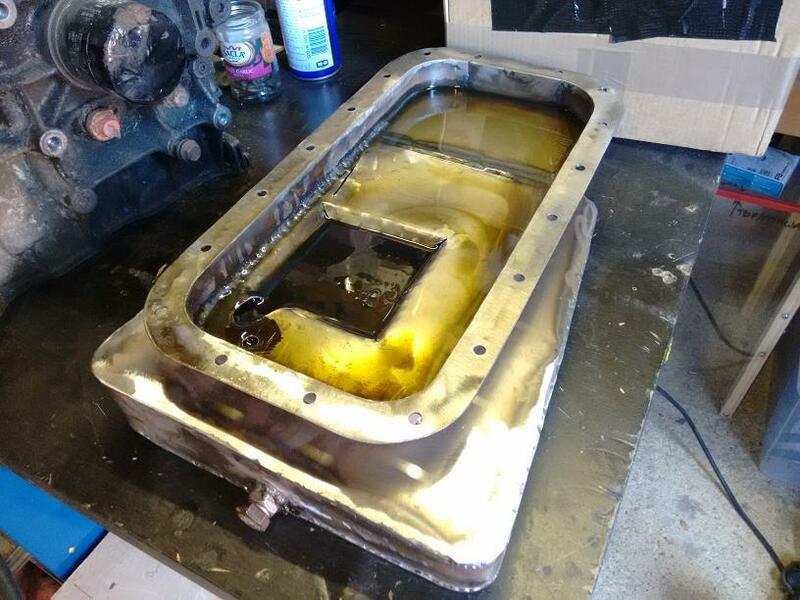 The mould was sanded with 200 grit sand paper and given 5 layers of wax. The wax helped to fill in the crevasses between the separate mould pieces and massively helped the release after moulding. In short, this stuff rocks. 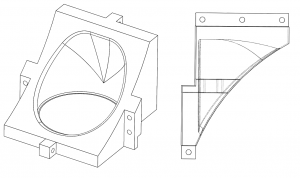 Once the mould itself was ready to use the mouldings were made in a fairly simple way. Firstly a layer of White Gel Coat was applied to the mould with a brush. 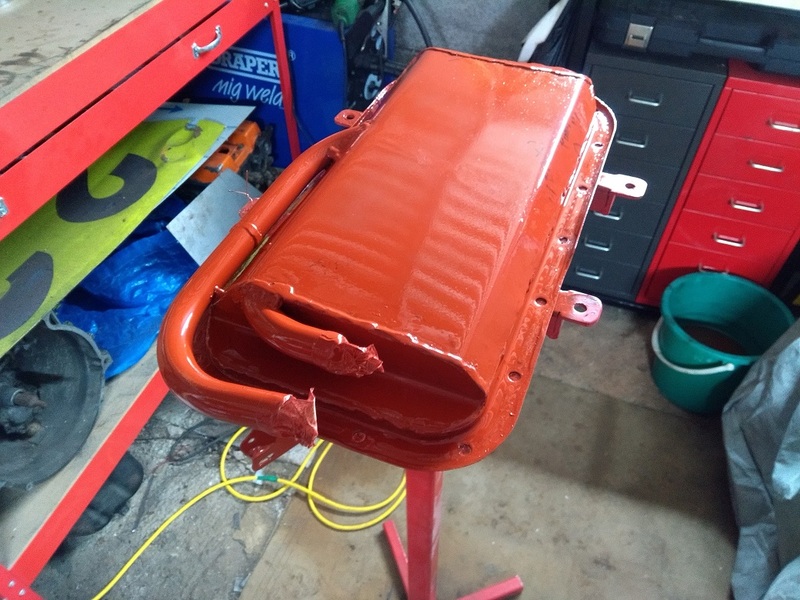 Gel Coat is essentially resin with pigment in, which gives the moulding an outer layer which can be sanded and painted to achieve a nice finish. If the mould is of a high quality the Gel Coat can simply be left as is. 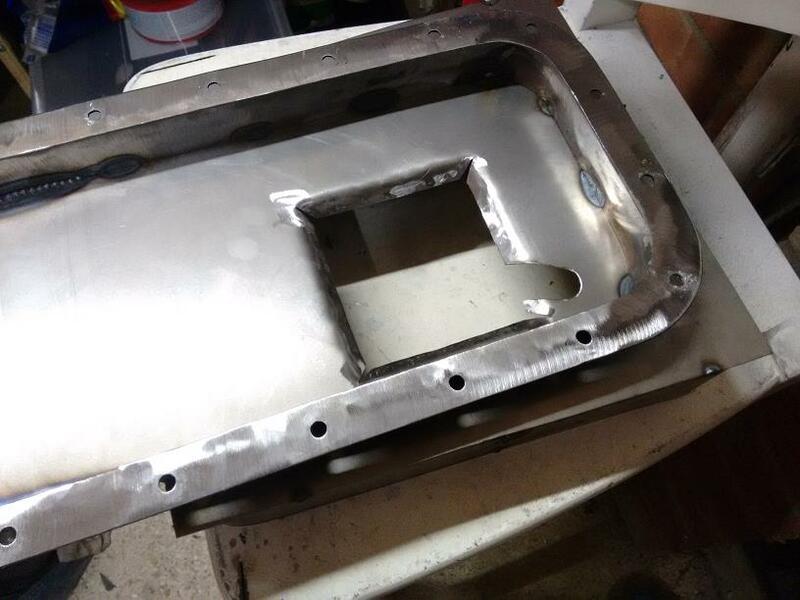 I would eventually be painting these moulds so I wasn’t too bothered about the initial surface finish. 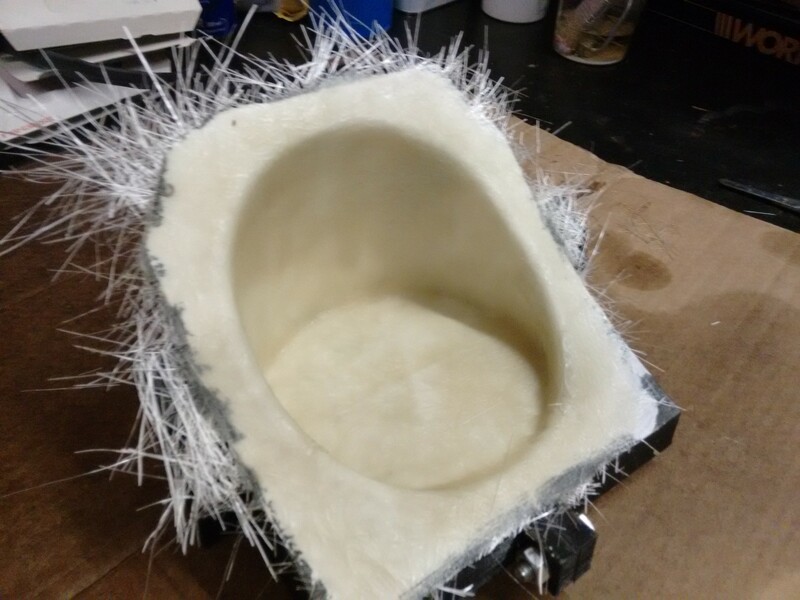 Once this had adequately hardened polyester resin was brushed into the back of the Gel Coat and 450gram fibreglass rolled into that (I gave it approximately 4 hours at 10degC, with a 3% mass fraction of catalyst to kick things into gear). 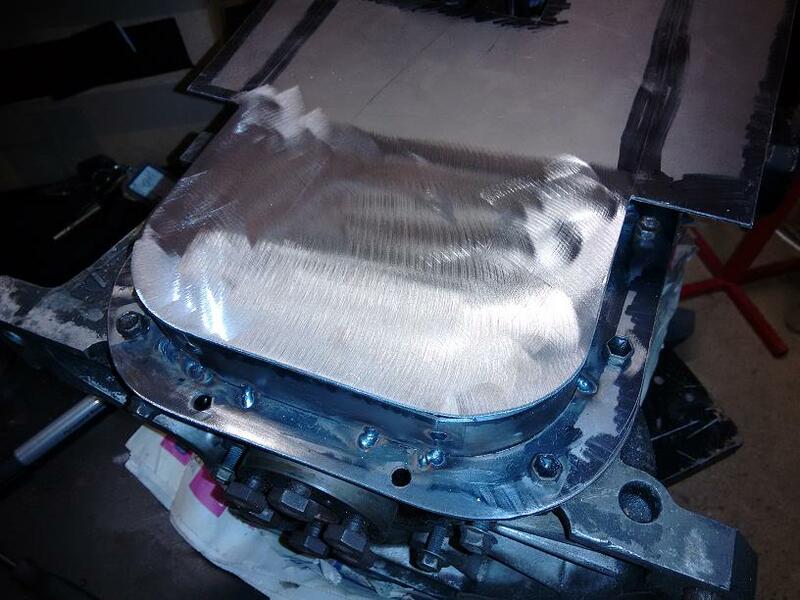 The rolling process is important as it helps to remove air bubbles from the structural fibreglass and improves the strength of the composite. 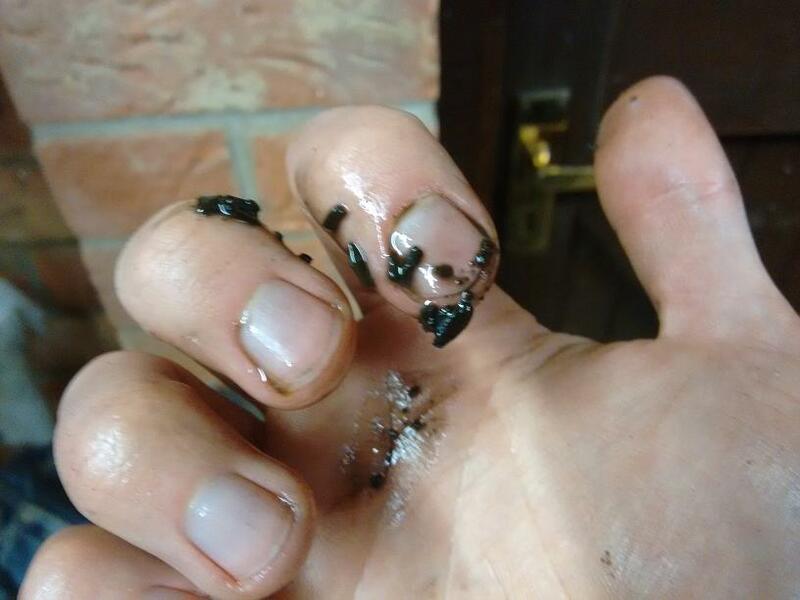 It also helps reduce the amount of resin you have to use, as the fibres are pushed tight against the Gel Coat and the resin soaked through. 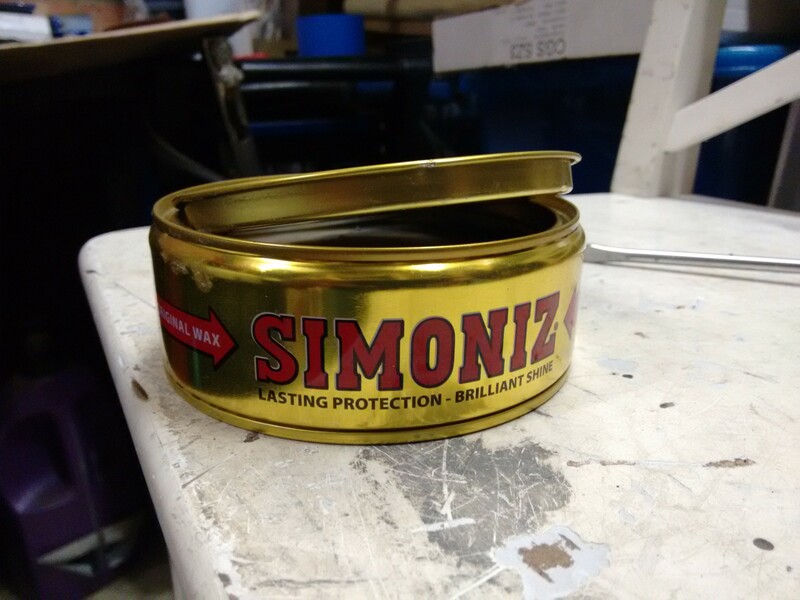 If the whole lot was just brushed on then it would have likely had a higher resin content and been heavier. This was left for two days to harden and then extracted from the mould. I’m very happy with the final product and its far lighter than I expected it to be. The ‘pods will be glued into the back of the arches and then faired in with filler. 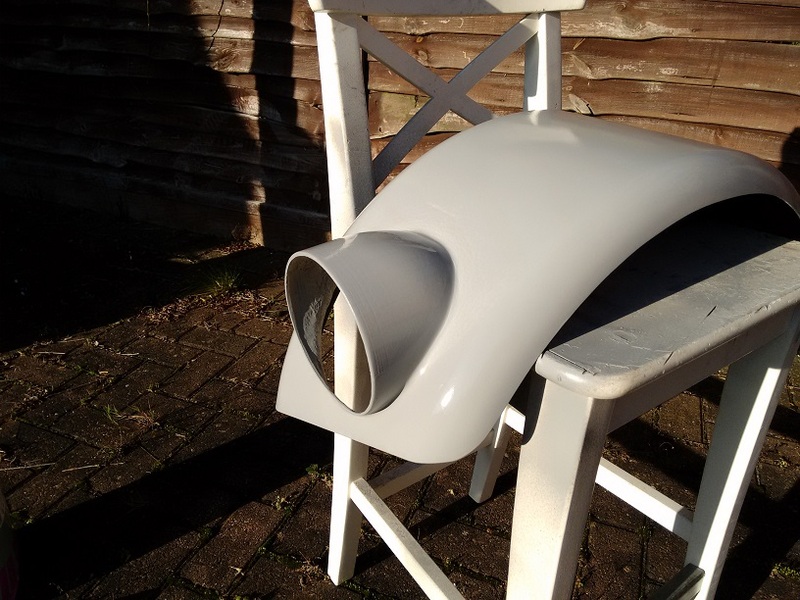 The whole lot will then be smoothed and painted; probably glossy battleship grey. 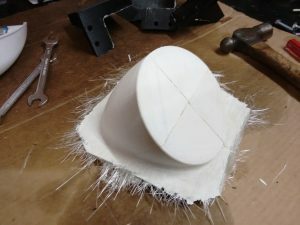 Have you ever tried any Fibreglass work? If not, give it a go! Its actually ver y rewarding and if you take your time with each step you can achieve great results.